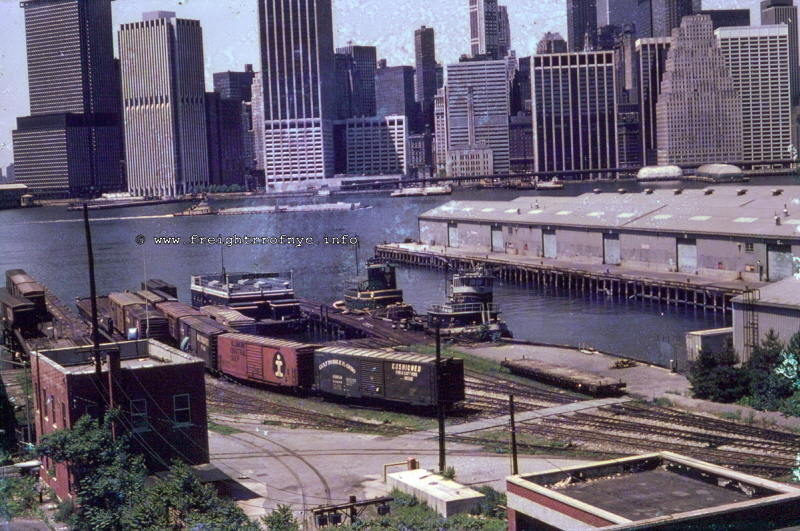 The New York Dock Company was a rail-marine offline contract terminal identical in operation to that of Bush Terminal, being that New York Dock and Bush Terminal had carfloating operations, carload and less than carload contract terminals, direct bulk offloading of ships to railcar, and would have large storage warehouses at their disposal (whereas the Brooklyn Eastern District Terminal did not have direct ship to rail or large warehouses). Carfloats with railroad freight cars would come from the various railroads on the mainland in NJ and the Bronx, and bring in commodities to three different pier terminals located south of the Brooklyn Bridge: (in north to south order:) Fulton, Baltic & Atlantic. 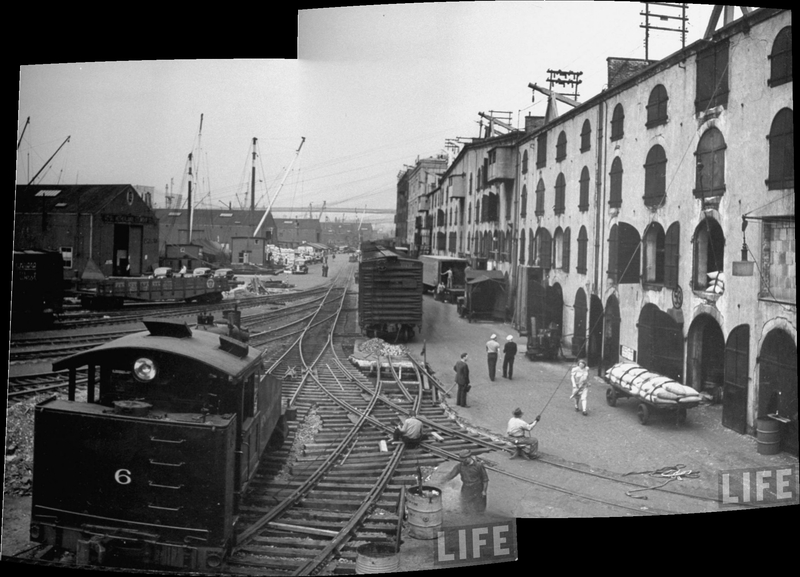 It also owned warehouses in Red Hook, that did not have rail access. 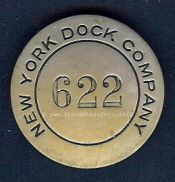 The New York Dock Company was the successor to the Brooklyn Wharf & Warehouse Company. On July 17, 1901, it purchased the Brooklyn Wharf & Warehouse property from under foreclosure and took possession of those properties on August 1, 1901. 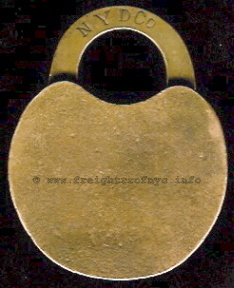 Other than the obvious railroad freight operations due to its status as a contract terminal, New York Dock Company also conducted business in the area of warehousing and storage, including both dry and cold storage. It would be one of the larger cotton storage facilities in the New York Harbor area. It would also lease space to several coastal and international steamship companies at its piers. "The property of the Jay Street Terminal includes six piers. 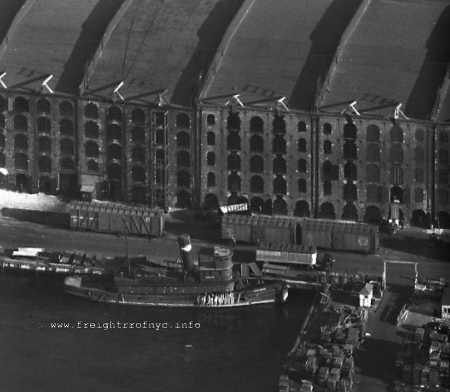 Three of the piers, with a ground area of 66,788 square feet and a shedded area 60,648 square feet, as well as several warehouses, with a total floor area of 440, 800 square feet, were acquired from the New York Dock in 1911. Two of the piers are open, while one has a shed with an area of about 7,000 square feet.". After this date, and New York Dock operations would be contained solely south of the Brooklyn Bridge at the Atlantic, Baltic & Fulton Terminals and miscellaneous piers and storehouses in Red Hook, Brooklyn. 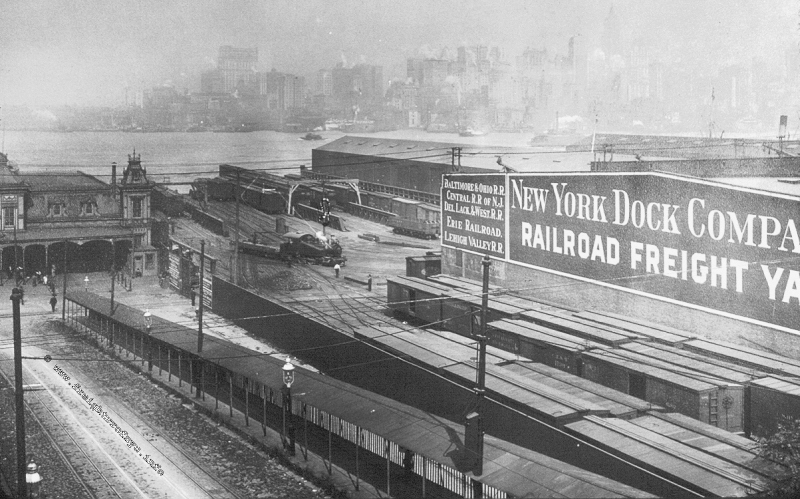 While railroad operations existed from inception of the New York Dock Company as can be seen from the Official Railway Guide advertisement, the railroad aspect of operations would not be formally incorporated as the New York Dock Railway (and as a wholly owned subsidiary of New York Dock Company) until October 1, 1912. . 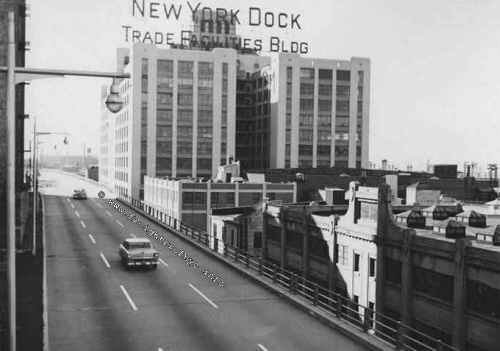 Following that sale, New York Dock would operated the Fulton and Atlantic Terminals, and would eventually open and operate the Baltic Terminal as well ca. 1913. Interestingly enough, Joe Roborecky located mention of the New York Dock in records pertaining of the 1939 World Fair. From what is mentioned, New York Dock provided freight receiving and forwarding including receipt & inspection services, as well as trucking and storage. the tugboat "Brooklyn" from Jakobsen Shipyard in 1960. Also interestingly enough, this brochure lists New York Docks' parent corporation as Dunhill International. Dunhill International was the name of a tobacco & smoking accessory manufacturer at that time (and now absorbed by British American Tobacco). 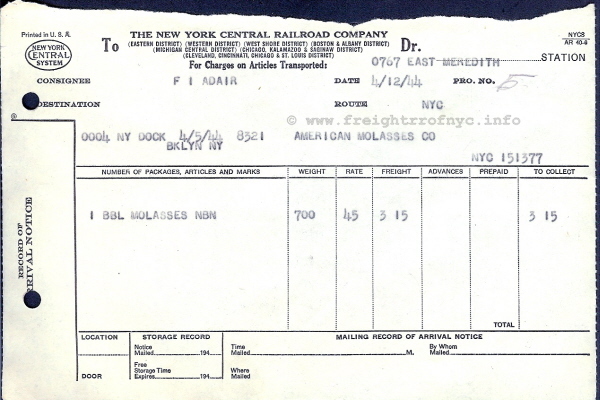 Now if this railroad - tobacco company connection "has a familiar ring to it" (and whether coincidentally or by intent), the Brooklyn Eastern District Terminal would also be purchased by a tobacco concern, that being R. J. Reynolds in 1973! R. J. Reynolds incidentally is now the American licensed distributor of "Dunhill International" cigarettes. Without any further documentation available to show any connection, I find it most interesting that two offline contract terminals located in Brooklyn, NY; were purchased independently, on two different dates, by two different tobacco companies (with some affiliation now between those two tobacco companies), only for those contract terminals to be merged with one another some years later. Whatever the reasons regarding this sale of New York Dock to Dunhill: is it simply a coincidence for the New York Dock to be sold to Dunhill and Brooklyn Eastern District Terminal being sold to R. J. Reynolds? After all is said, there is a 17 year gap in the sales. Further research might reveal... and is ongoing. Also, without any real opportunity (or hope) for confirmation, is the persistent rumor that somewhere within the ownership and administration of the New York Dock organization in the latter half of the 20th Century, was the involvement or influence of organized crime. As a historian, I would love nothing more than to venture further and deeper into this rumor and either prove or disprove involvement. If in fact this organized crime involvement did exist, it would be great to learn to what actual involvement and extent it took place. But as I am sure most savvy readers can understand, this is not the kind of information that is recorded for posterity. And, while I am aware I can start making inquiries, I have no desire to "sleep with the fishes". So unless by some course of events this organized crime involvement was officially recorded in law enforcement filings, indictments or warrants, I doubt any further documentation can substantiate this persistent rumor. It is well worth noting that organized crime has, for better or for worse; held a long standing involvement in many forms of transportation throughout the New York City area (as well as around the United States). Whether or not the reader of this website has positive, neutral or negative personal feelings regarding organized crime and its existence and involvement, they were very much part of the history of transportation industry in the New York Harbor area, and thus cannot be ignored. Whether being a part of this involvement in organized crime or not; it has also been alleged that a senior administrative officer of the New York Dock Company (in its final years of operation), was detained and investigated by federal law enforcement authorities. It had been discovered that consignees freight cars were not being delivered as promised, and the carfloats loaded with those cars were actually being "squirreled away" at the Brooklyn Army Terminal piers located near Bush Terminal. The Brooklyn Army Terminal, being federal property; led to the federal authorities involvement. It is currently unknown why this was done, but we can always speculate that it took place to hasten the end of carfloating operations by driving away carfloating customers. The outcome and conclusion of this investigation remains undisclosed at this time. 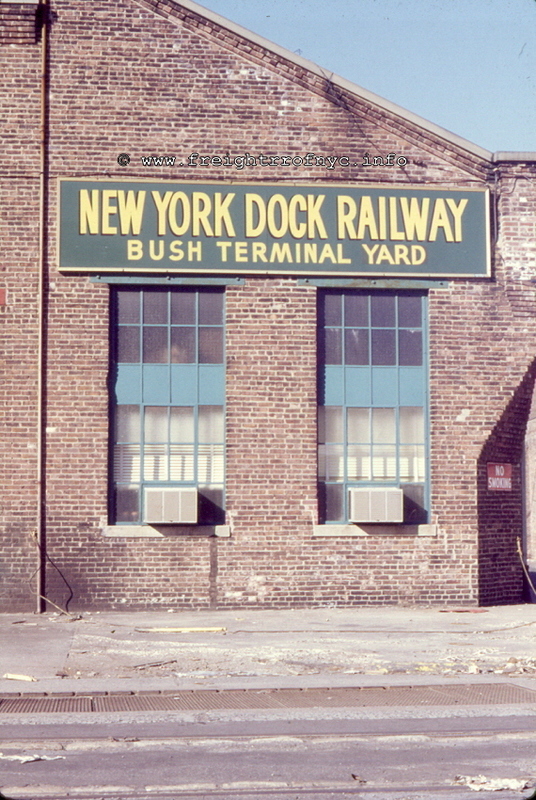 Following the bankruptcy of Bush Terminal in 1971, the City of New York purchased the land that Bush Terminal sits upon and leased the railroad operations at Bush Terminal to New York Dock in 1972. 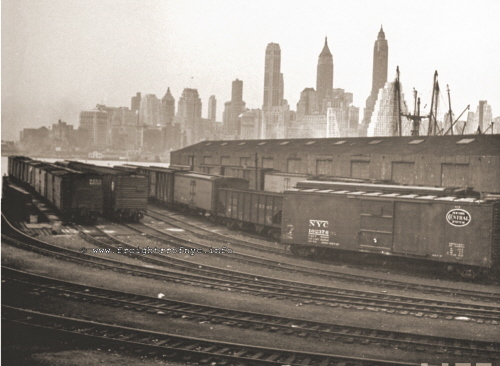 As with almost every railroad, following the acceptance and widespread use of long distance trucking, almost every railroad in the Northeastern United States began to suffer financially, and New York Dock would be no different. In July 1975, the United States Railway Association released its "Final System Plan" which in accordance with the Regional Rail Act of 1973, made recommendations for the reorganization of the railroads in the Northeast United States. Subsequently, the Interstate Commerce Commission recommended that New York Dock and Brooklyn Eastern District Terminal operations be merged to avoid duplication of effort. 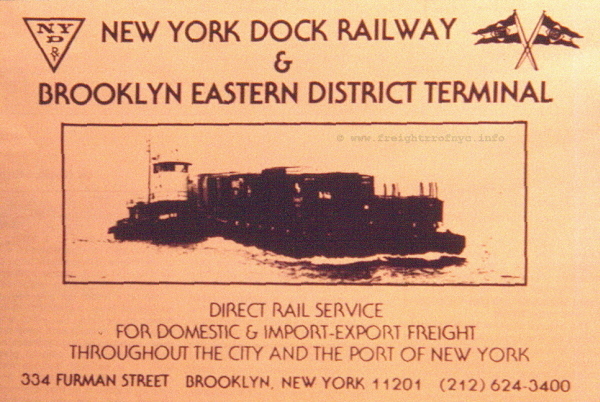 It would not be until 1978 (as it is currently understood) that Dock Properties, the parent company of the New York Dock Railway, purchased the Brooklyn Eastern District Terminal. 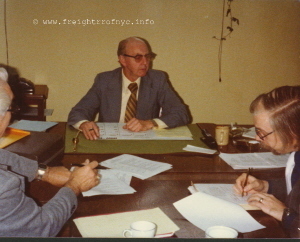 Negotiations started in September 1977, but with all the legal folderol involved in merging the seniority lists of the Employee Unions, it was not until early 1978 that New York Dock took actual possession. And even after this date, several proceedings and appeals were filed. Regardless of these questions and financial statistics, New York Dock somehow purchased and merged with the Brooklyn Eastern District Terminal. Below are photographs of the contract signing, between NYD administration and BEDT employees, represented by J. Roborecky, ca. May 1979 or May 1980. Now, it is not this authors intent to appear "anti-New York Dock", but a very significant circumstance which appears to be unusual in nature has arisen through research. "The accounts of New York Dock present a dismal financial picture, with a negative working capital position, substantial over-capitalization, a negative net worth, and a 3-year record of deficit operations." 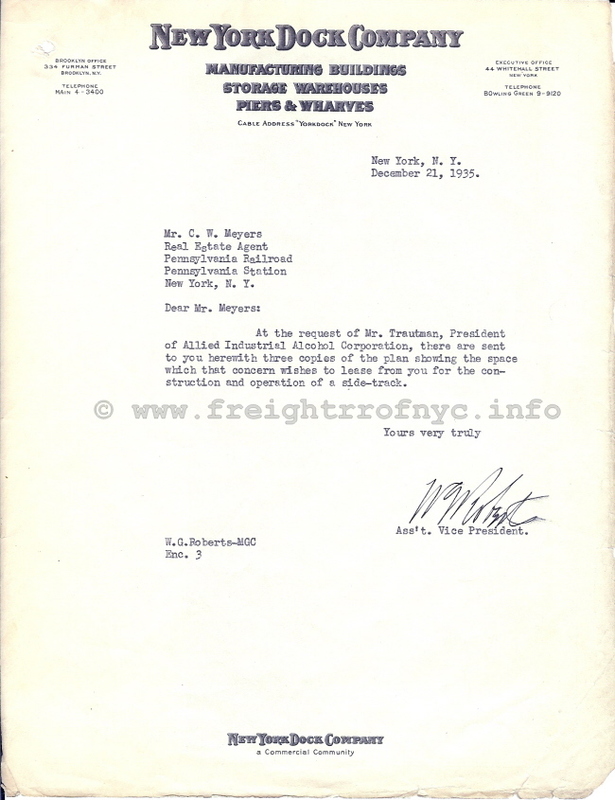 The administration and personnel of both New York Dock Railway and Brooklyn Eastern District Terminal organizations would be merged, with difficulties in seniority standings not withstanding. But eventually the two operations would merge. Strangely, the two organizations would keep their own separate identities and heralds until the end of operations in 1983. But, throughout this same time period, rail and locomotive equipment would be pooled and shared, with BEDT locomotives showing their presence at Bush Terminal and New York Dock properties, and New York Dock locomotives showing up on Kent Avenue as well (albeit very infrequently and this author has never seen photographs of this occurrence). But New York Dock, and not to mention the City of New of New York (and the rest of the United States as well); were all facing severe fiscal crises and things were only to get worse. 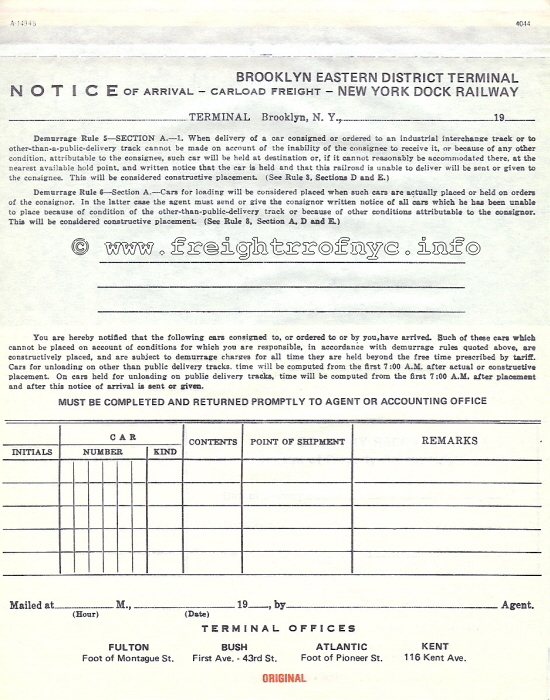 The bottom line was New York Dock Railway published a Notice of Intent to Abandon Service on April 8, 1983, concurrently with the Brooklyn Eastern District Terminal. 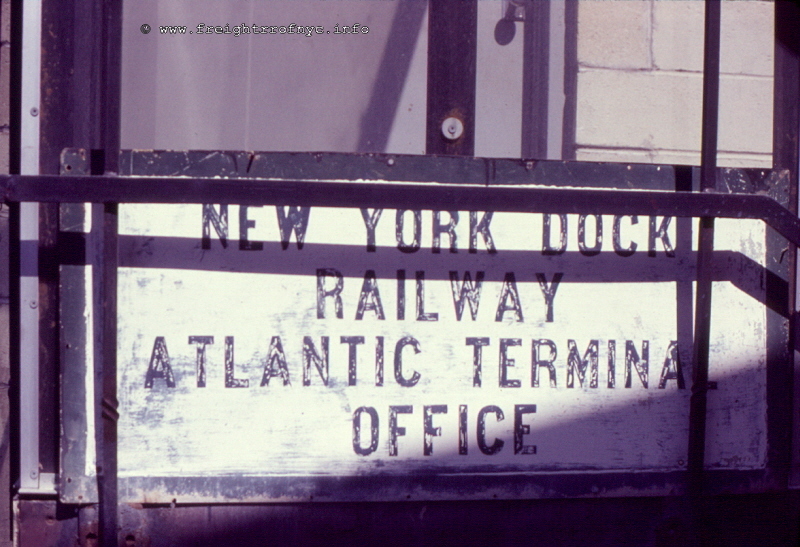 The abandonment was to include all of New York Dock's rail and marine services. The filing of this Notice of Intent was followed by an Application for a Certificate of Abandonment on May 2, 1983. 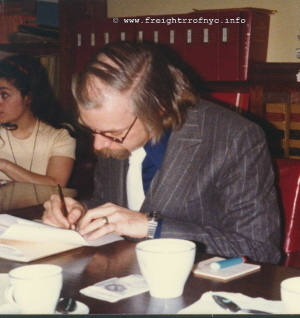 For reasons similar to those put forth by the Brooklyn Eastern District Terminal, carloadings for New York Dock dropped 77% in the ten year period between 1973 and 1982. Business for the final three months of 1983 was 36% less than in the same corresponding period for 1982, and 56% less than in the corresponding period of 1981. In the same manner as that of the Brooklyn Eastern District Terminal, New York Dock attempted (unsuccessfully) to reach agreement with the labor unions to change outdated and costly work rules and practices. 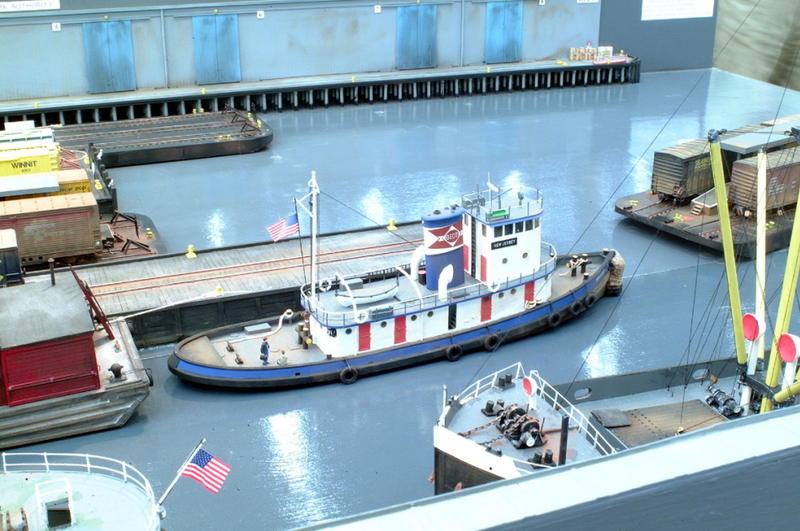 Also, New York Dock's infrastructure required substantial modernization, rehabilitation and renewal at a cost of nearly $12 million, and this greatly exceeded the earning or borrowing potential of New York Dock. Also, it was stated that in recent years prior to the abandonment filing; it (New York Dock) had been forced to sell corporate assets to meet current obligations. It had a loss of $244,511 in 1982, with an aggregate retained deficit of $3,209,777. Its balance sheet as of December 31, 1982, showed current assets, exclusive of amounts due from NYD Properties and affiliated companies, of $877,574, as against current liabilities, exclusive of amounts due to affiliates, of $2,422,538. Perhaps the most detailed case of the financial picture between the two operations comes from this abandonment appeal. As far as it is known, the Brooklyn Eastern District Terminal, while suffering from dwindling revenue and in some cases operating losses as well, still appeared to be in a better financial position (by whatever margin) at the time of its sale to, and merger with New York Dock (refer to their financial statistics in the Abandonment Appeal). However, it is also understood that New York Dock had already filing for bankruptcy reorganization proceedings at the same time. Whether the Brooklyn Eastern District Terminal was either purchased by New York Dock to help offset losses, or whether New York Dock purchased the Brooklyn Eastern District Terminal for other reasons, and what New York Dock used as capital for the purchase remains unknown. 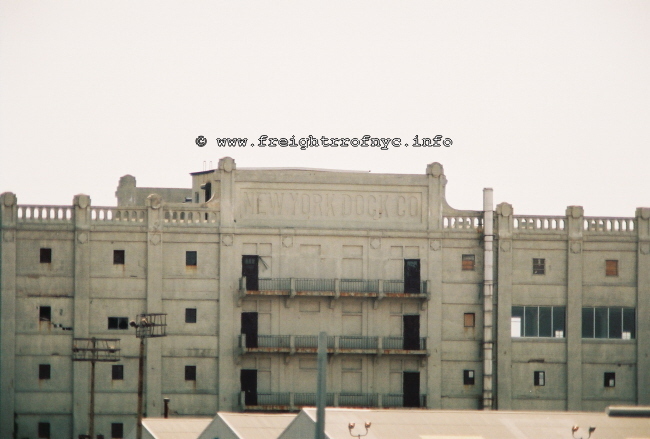 It has been hypothesized that New York Dock purchased the Brooklyn Eastern District Terminal properties at Kent Avenue with the intent for investment value for future real estate / land development (which is exactly what happened, although it has taken 25 some odd years later and the principals involved with the original sale / purchase no longer involved or deceased). BUt the most substantial question that arises, is how one failing company (NYD), could have the wherewithal to purchase a more financially sound company (BEDT), but not the resources to modernize its infrastructure, that might have prevented abandonment in the first place. 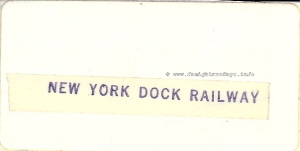 Regardless, New York Dock ceased operations on August 17, 1983. The successor to New York Dock would be New York Cross Harbor Railroad, with operations continuing at Bush Terminal and Atlantic Terminal, but Fulton Terminal would not see a reprieve from its closure. Atlantic Terminal would eventually close a few years later in 1992, to eventually to be converted into a passenger cruise ship terminal. 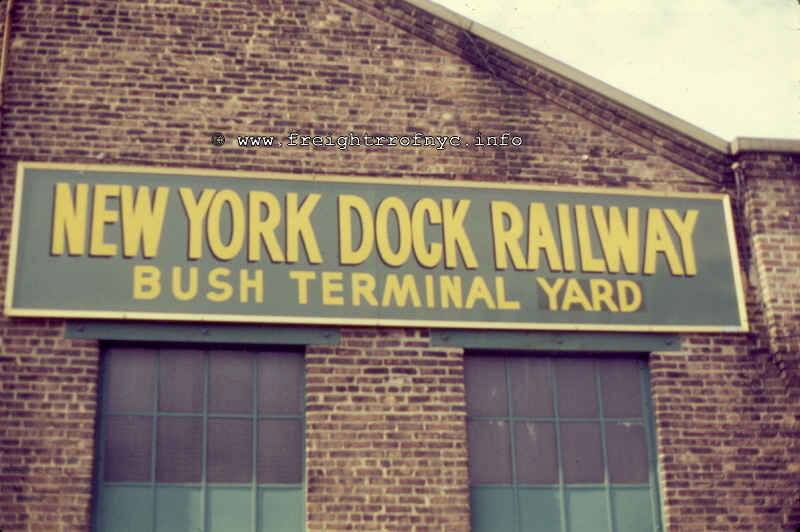 And now only Bush Terminal remains in operation under its current operator: New York New Jersey Rail, and Bush Terminal operation should be noted is the sole remaining offline rail-marine contract terminal in the City of New York. 1937 New York dock recapitializes, relocated administration offices from Manhattan to Brooklyn. 1960 last new marine equipment purchased: tugboat "Brooklyn"
? Questor Toy Co purchases New York Dock? New York Dock began operations with two properties: Atlantic & Fulton Terminals, with some structured scattered inland and off terminal property and piers. Both of these terminals began service under New York Dock ownership in 1901, having been acquired from Brooklyn Wharf & Warehouse. The Fulton Terminal was located just south of the Manhattan Bridge and occupied the East River waterfront from Fulton Street in the north to State Street in the south and from the East River bulkhead on the west to Furman Street on the east. Two floatbridges would be located at the foot of Montague Street, with a four track pier yard between them. The Atlantic Terminal which was located farther south, occupied the East River waterfront from Bowne Street in the north to Dikeman Street in the south, and ran from the waterfront on the west to Van Brunt Street on the east. In the middle was the Atlantic Basin, a protected man made harbor. As we will come to witness in the individual terminal chapters below, New York Dock embarked on a massive investment of the infrastructure of Fulton and Atlantic Terminals as well other piers they owned in the Red Hook section. This included the outright new installation or reconstruction of existing piers, piersheds, bulkheads, transfer bridges, piling, and so forth. To date, I have only managed to locate the reports of the Department of Docks & Ferries for years 1902 and 1905. Perhaps most importantly, this compilation notes those piers and dock not contained within Fulton & Atlantic Terminals, and reflects how vast the property holdings of New York Dock truly was. Sometime circa 1911; a third terminal was constructed, and was named Baltic Terminal. This was also the smallest of the three terminals. This terminal was located between Fulton and Atlantic Terminals and despite the close proximity to either, none would not see a trackage connection to the other terminals. Also, a parcel of land owned by New York Dock, situated between the Brooklyn and Manhattan Bridges; was sold to Jay Street Terminal in 1911. This parcel contains the Empire Stores, (which are currently listed on the New York Landmark Conservancy Endangered List) as well as the Empire - Fulton Ferry Park is upon this land. 1 = This freight house used for Fulton & Atlantic Terminals, and also after 1905 when the freight houses of those terminals were discontinued. 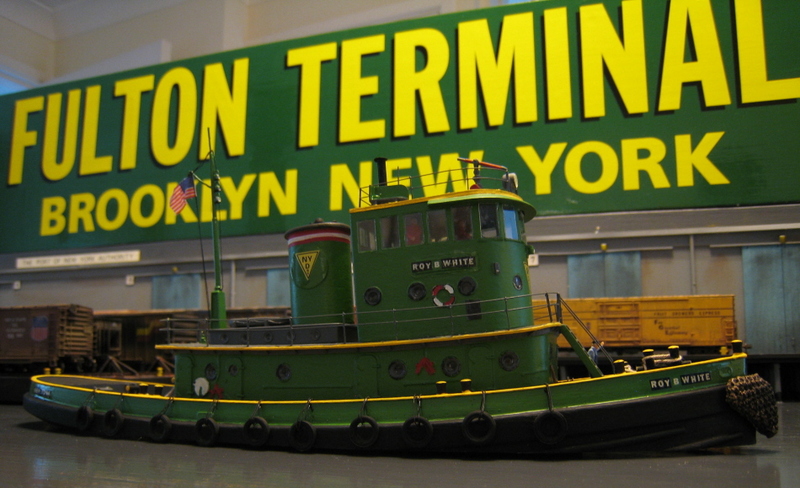 "One of the most important terminal companies is the New York Dock Co. This company owns practically the entire South Brooklyn water front from a point immediately south of Brooklyn Bridge to Erie Basin, a distance of about 2 � miles. The property of this company includes 35 piers with a total area of 1,741,925 square feet and a shedded area of 1,425,892 feet, more than 150 warehouses with a floor space of 5,746, 937 square feet, two factory buildings with a floor area of 441,600 square feet, and grain elevators with a storage capacity of 2,025,000 bushels, in addition to three railroad terminals, car-float bridges, car floats, tugs, and lighters. Some of the warehouses are six stories in height, while many have five stories. This company is said to have the largest bonded and free warehouse system in the Western Hemisphere. Seven of the warehouses, with a floor area of 322,874 square feet, are used for cold storage. 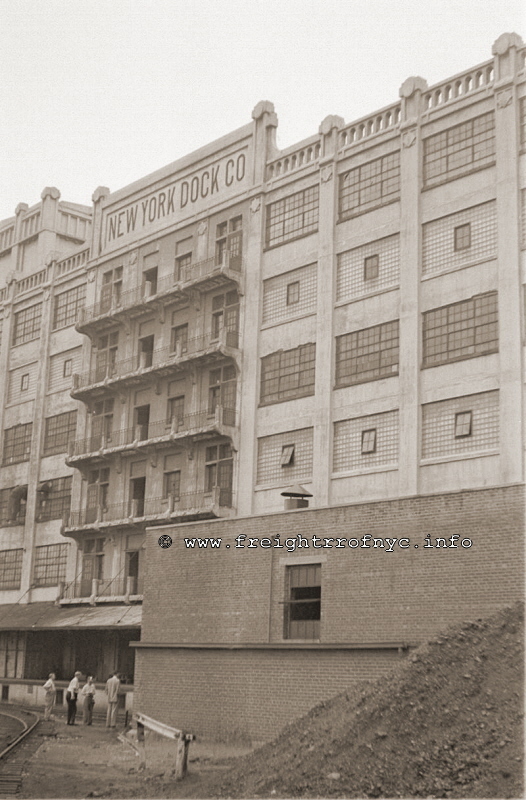 In recent years, the New York Dock Co. has followed the example of the Bush Terminal Co. in constructing loft buildings for manufacturing purposes. Two buildings 460 feet long, 80 feet wide, and six stories in height and of reinforced concrete construction, have been erected. 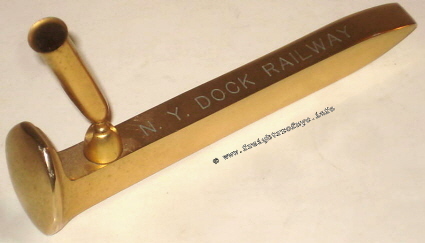 The New York Dock Co. controls by stock ownership the New York Dock Railway, which operates three freight terminals known as the Fulton, Baltic and Atlantic, in connection with the piers and warehouses of the New York Dock Co. These terminals are provided with float bridges for transferring cars from floats to freight yards and with tracks leading to the warehouses and piers of the dock company. National Navigation Company, New York and South Americana Line, West Coast Line to South America, Ward Lines and United States & Australasia Steamship. 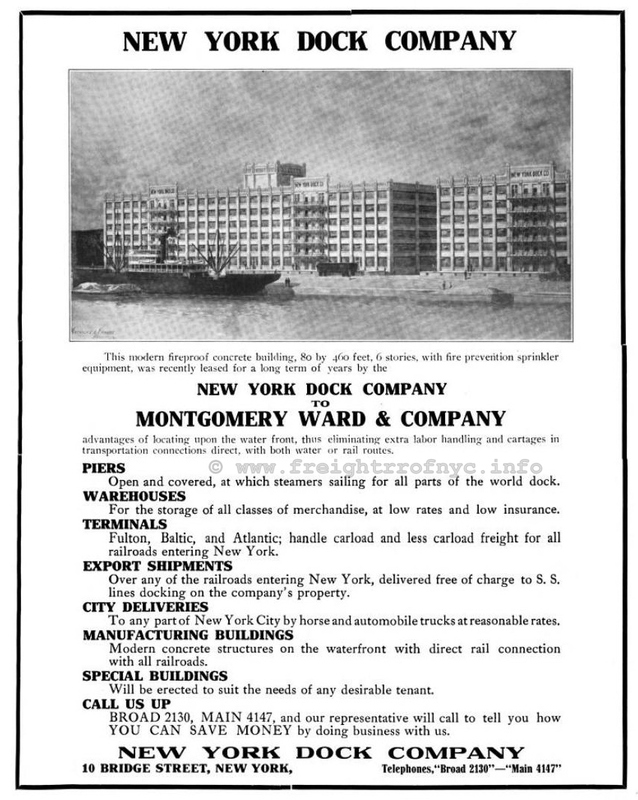 In 1921, the New York Dock Company was still expanding and now had 159 bonded warehouses with a storage capacity of some 65,000,000 cubic feet; and 34 piers, the longest measuring 1,193 feet and containing more than 175,000 square feet. 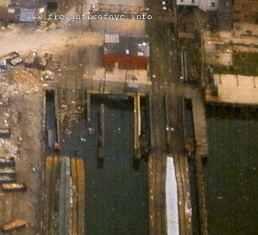 These piers had a total deck space of sixty-one and a half acres. .
From 1976 through 1978, the New York Dock was contracted to perform the carfloating work for the Baltimore & Ohio Railroad out of the St. George Terminal in Staten Island and the Baltimore & Ohio 26th Street Terminal in Manhattan. 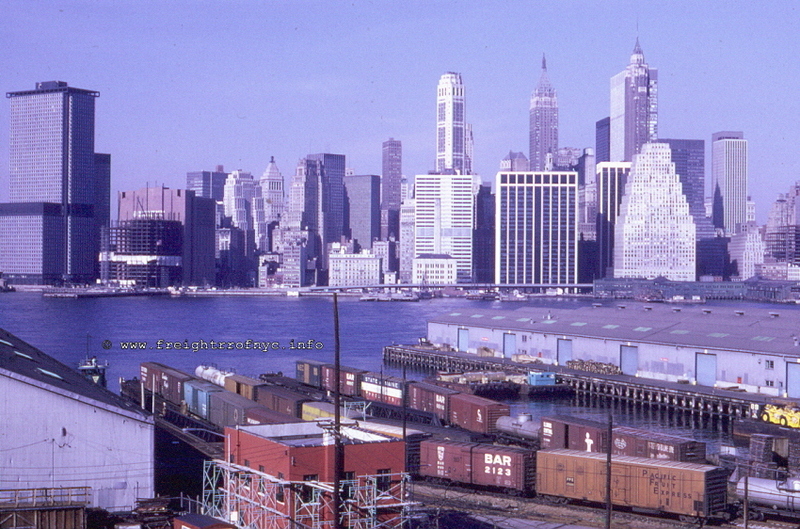 In 1978, New York Dock merged with the Brooklyn Eastern District Terminal and combined with their operations. By way of this merger, the New York Dock would again acquire even more property at Kent Avenue, as well as the lease to the land and carfloating operations out of the Greenville Yard in Jersey City, NJ. 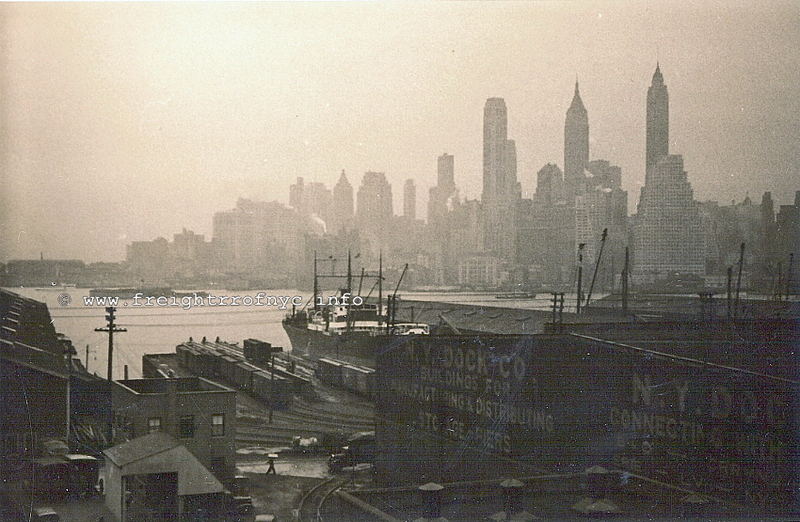 New York Dock in its early years, was primarily engaged in the business of storage & warehousing. Almost a full seventy-five percent of the items that came to be stored in the New York Dock storehouses were foodstuffs, with the majority of that being coffee. These commodities were stored in what was then called "stores". These are what the current everyday pedestrian calls a "warehouse". Most of these stores were constructed of wood beam supports and brick walls. Design characterization of the construction of these stores was: a great amount of access (door and windows) on front and rear walls, but little to no access from one store to another store on either side. 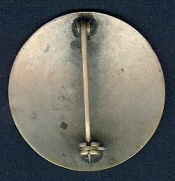 The reason for this, is believed to be for fire protection. Prior to widespread electrification, kerosene lanterns were commonly used for illumination, and several stores around the New York City area resulted in some spectacular fires and of substantial financial loss of contents. Obviously, as fast as can be installed, the stores would be equipped with electric lights and fire suppression. On the front and rear walls, while I call them a "window" here, they were not glazed in and open. These windows being large, and typically with an arch top. Hinged steel non-louvered shutters provided protection from the elements. In some cases a wood or steel beam projected out from the window at the top of the arch or roof and provided for an overhead trolley with sheaves for lifting. Fortunately, due to their stout construction, many of these stores survive today, some of these being located along Water Street in the DUMBO neighborhood, as well as along Barnell and Van Brunt Streets in the Red Hook area. 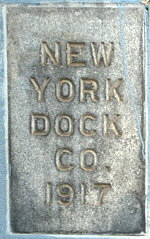 New York Dock's stores were named, with those names being: "Martins", "Robinson", "Roberts", "Governors", "Red Hook", "Woodruff", "Clinton", "Union", "Prentice", "Pierrepont", among some others. Some appear to be named after prominent Brooklyn businessmen and residents of Brooklyn Heights, which overlooked the New York Dock piers; and likewise, the local streets (which were also so named after the same prominent people). The following information, gleaned from the 1920 Joint Report with Comprehensive Plan and Recommendations undertaken by New York, New Jersey Port & Harbor Development Commission on Waterfront Development. 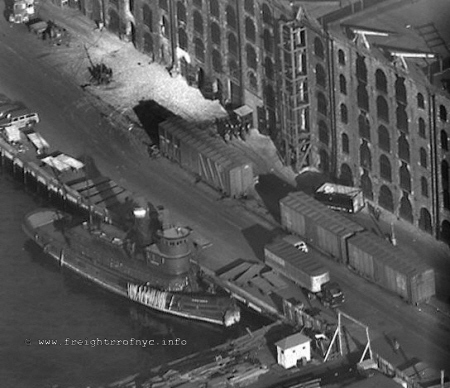 A study and tally was conducted of all freight arriving at New York Dock Terminals during the period of January 1, 1919 through September 30, 1919. * The remaining 17.2 percent being comprised of miscellaneous commodities of less than 1 percent. 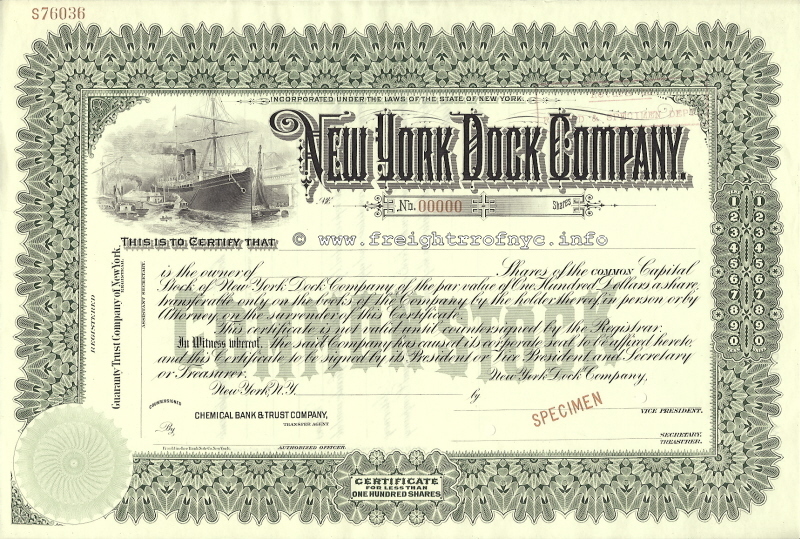 The following names of businesses utilized the services of New York Dock, whether that be receiving, shipping or leasing space; and come from several New York Dock issued publications currently in the collection of Benjamin W. Schaefer, as well as shipping receipts in the collection of the author. 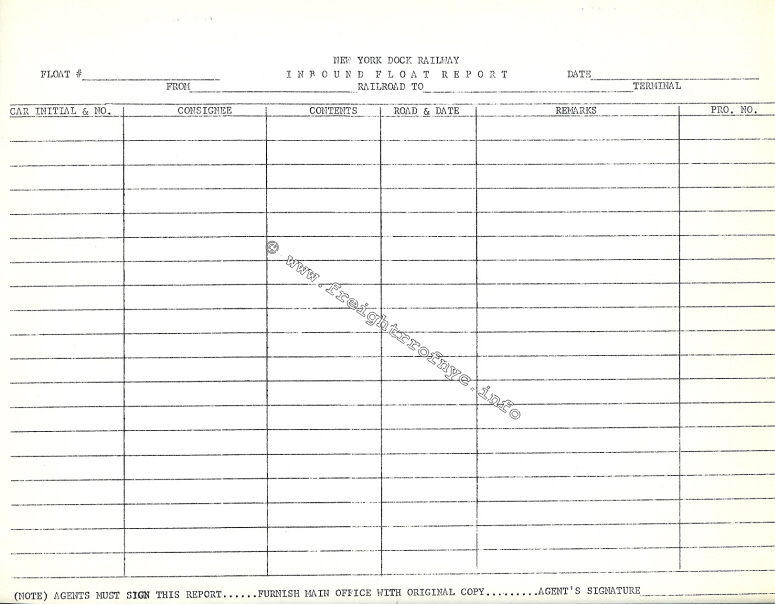 employee & administration list for Brooklyn Eastern District Terminal, for those employees that worked for both organizations. On this list those employees are italics. Armin Pasquariello Master Mechanic . 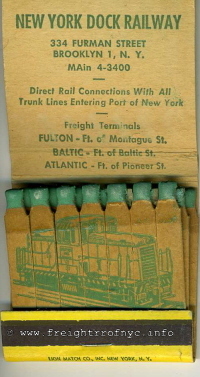 It should be noted, that the Atlantic, Baltic & Fulton Terminals were never physically connected to one another, and locomotives were usually left at each location, as carfloating to and from these terminals usually occurred around the clock. This carfloating operation was in addition to "break bulk" and complete carload shipments of cargo being unloaded directly from ships into/onto railroad cars at the waterfront piers and being moved to the warehouses for storage. 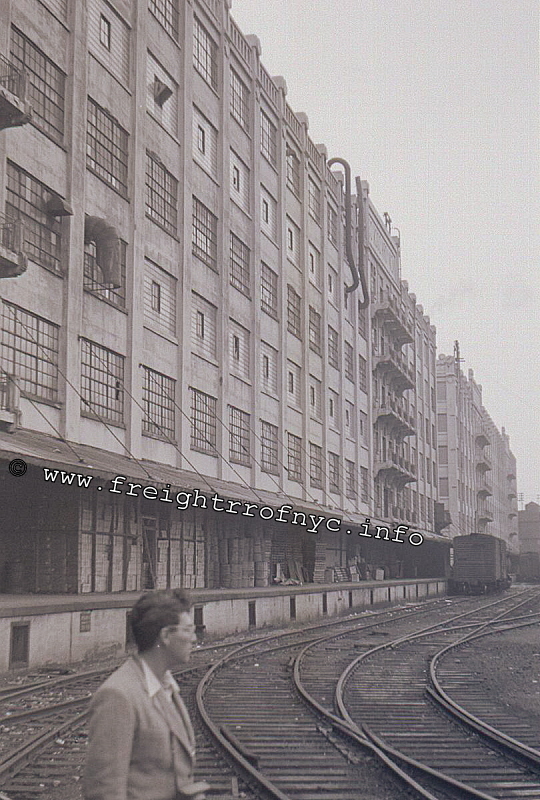 Supposedly, installed in one of the New York Dock buildings was a freight car elevator. This was an elevator with a weight capacity for standard gauge freight cars. Apparently a freight car would be placed in the elevator, and that in turn would raise the boxcar to the appropriate floor in the warehouse to be loaded / unloaded. It is believed that this elevator was installed the building most recently occupied by Watchtower Publications, located in the Fulton Terminal, but this unconfirmed. Tom Flagg furnished the following map (along with many others) during a research meeting on 10 June 2009 with Joe Roborecky and myself. The map is taken from an original 1912 J. W. Galbreath (Consulting Engineer), that was regenerated by Charles Parrott in 2002 who performed raster clean up and repair. 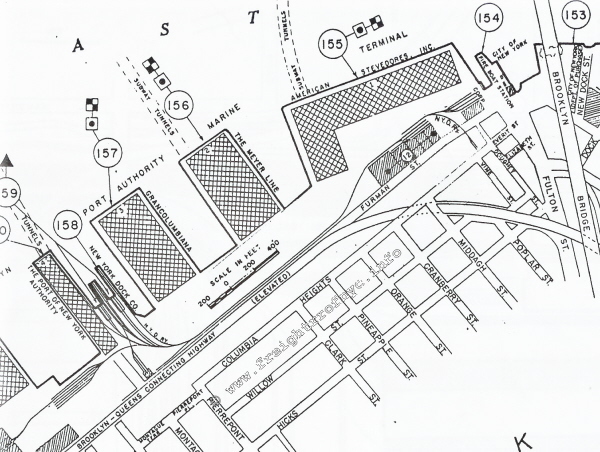 This map is important as it contains all three terminal (Fulton, Baltic & Atlantic) of New York Dock on one map, all to the same scale, in their original configurations (as far as can be ascertained), and showing all street connections prior to the razing of the warehouses in the Fulton Terminal due to the construction of the Brooklyn Queens Expressway. This map shows the very close proximity of one terminal to another, yet how they were never connected. It also shows with great detail the structures located in those terminals and the trackage configurations. This map is huge, so please allow some time for it to open. Click on the image below to view a high resolution large scale version. Also, use your back arrow on your web browser to return you here. 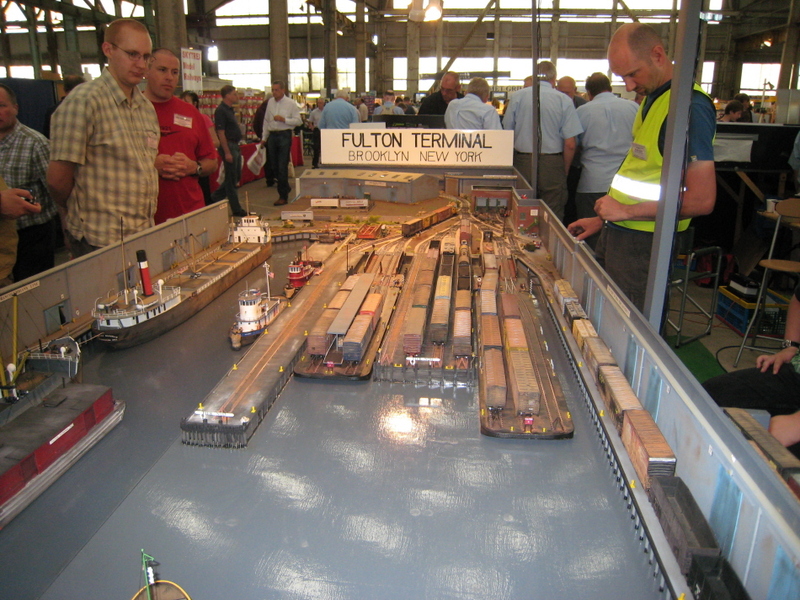 Fulton Terminal was one of two original New York Dock terminals (along with Atlantic Terminal). 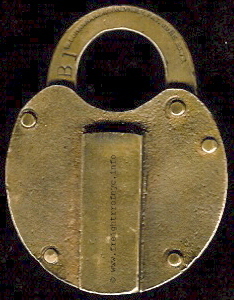 Most of its track was located on and along the bulkhead. When this terminal opened in 1901, this location sported a large wood pier holding four tracks, which served as the main storage yard for the railroad cars, and on either side of this "pier yard", the float bridges were located. The first float bridges installed at this location were pontoon supported pony trusses with overhead cable supports. In later years, the pony trusses were replaced with pony plate girder float bridges, and the overhead supports were removed as well. On the north side of the northern float bridge was a long narrow "finger pier" with one track on it. there is a locomotive pulling a cut of two New York, New Haven & Hartford boxcars to the left of the left float bridge. This next image is of the pier and track arrangements and is dated 1911. 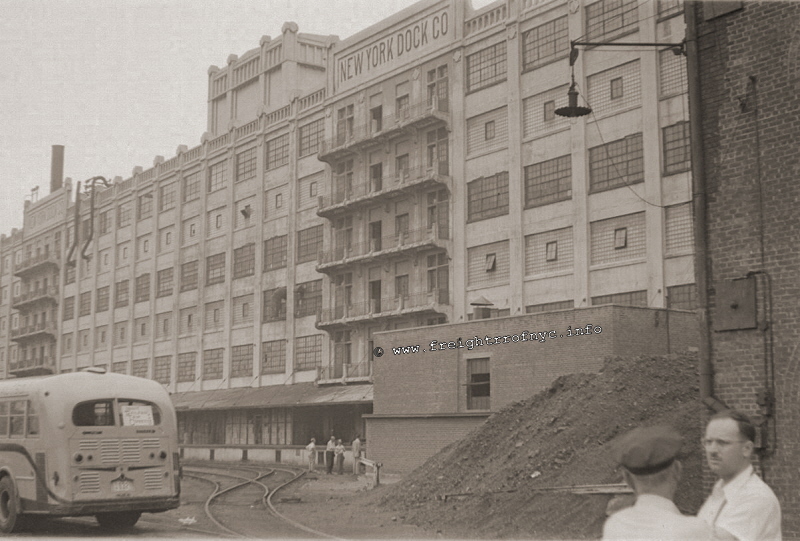 Following, is another shot of the Fulton Terminal, taken from Montague Street (according to the description with the photograph). The photo was taken in 1913, but I have a few doubts about the location. There is a ferry terminal just south of the float bridges in the 1911 photo above. The Wall Street Ferry Terminal which was located at the foot of Montague Street would be here, yet it is not. You can see the gantry of a float bridge just over the two box cars on the right edge of the photo. Historical accounts reflect that the Wall Street Ferry ceased operation in 1912. So, was the Wall Street Ferry Terminal demolished between 1912 and 1913, the time this photo was taken? The overhead trolley wire with street tracks would indicate a trolley line. The Montague Street trolley line ran to the Wall Street Ferry Terminal, but as you plainly see, there is no terminal. Just a fence, a few yards of bare ground and then water. The Montague Street street car line was built as a cable car. I can find no historical record of it being converted to overhead electric. the striped stack of either the "New York Dock" or the "Brooklyn" can be seen. Located online in the Life Magazine archives are the following three photos, of which all were taken in 1943 and all of which pertain to the Fulton Terminal. The top two contain a great many details not normally seen in the standard railfan photos of the locomotives. The two photos above were taken within seconds of each other and are looking north with the piers and warehouses. Interestingly enough, we can see a "diamond" (crossing) being installed. The tracks that branch off to the left of the photo lead to the float bridges and pier yard. leads to the southern part of the property and the enginehouse (behind photographer). The warehouses on the right of the photo would be razed not many years later. Mike Shea took the original Life images and used AutoStitch to merge them into a single image. Clicking on the image above will take you to a full sized uncompressed version. Use the back arrow on your browser to return you here. The result provides a better sense of the entire scene in front of the photographer, and I am honored he sent me the composite image for use here! This photo is looking west at the pier yard with a small portion of the float bridge on the left edge. Pulling back from the float bridges to Furman Street and to the south was a three stall enginehouse. The Ward Line pier (#15) has a single track that ran the outside north edge of the pier to serve the piershed. (this track can be seen in both the E. Belcher Hyde map above and Port Terminal map below). 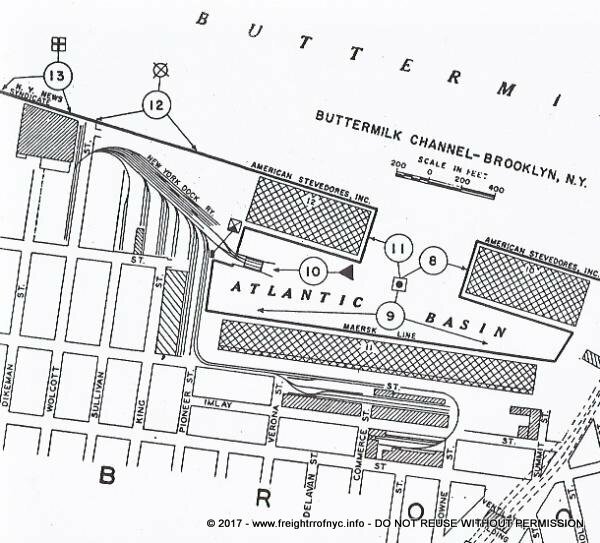 In the US Army Corp of Engineers Port Terminal map below, we have a better graphical representation of the track layout in later years, after these warehouses along Furman Street were demolished for the construction of Brooklyn Queen Expressway, and the Brooklyn Promenade. Fulton Terminal - post 1962? Exiting the float bridge leads, trackage extended to both the north and south serving (but not going onto) a multitude of piers, steamship lines and land based customers. The enginehouse is located over the "NN" in "CONNECTING" in the map above. The northern most tracks extended almost all the way to the Brooklyn Bridge serving a small yard. A spur that crosses Furman Street just south of Doughty Street led to the Watchtower Building. Watchtower Publications had a huge printing plant in that building (for the Jehovah's Witnesses bibles and publications). This building was formerly occupied by the Squibb Pharmaceutical firm. Also, the Brooklyn Eagle newspaper was formerly located across the street and both of these firms would receive rolls and pallets of paper that would be brought in by boxcar. 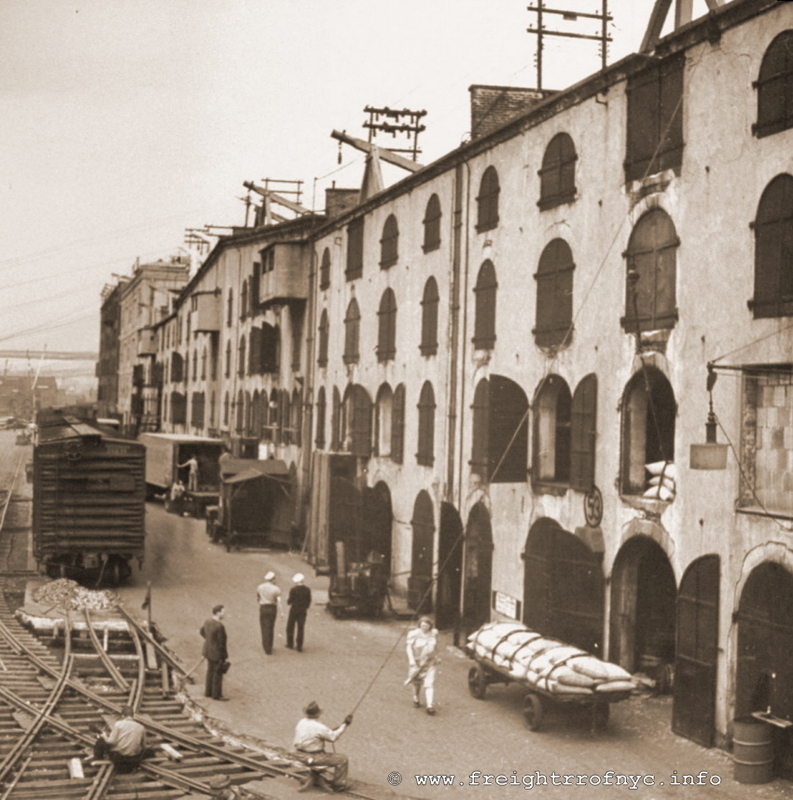 As discussed early, it is to my understanding, that one of these buildings had a freight car elevator, that is; an elevator large enough to hold and lift a full sized railway freight car from floor to floor. The spur to the Squibb / Watchtower used to lead into the building and this is the most viable candidate for this information. The remains of this spur can be seen in the photo to the right. 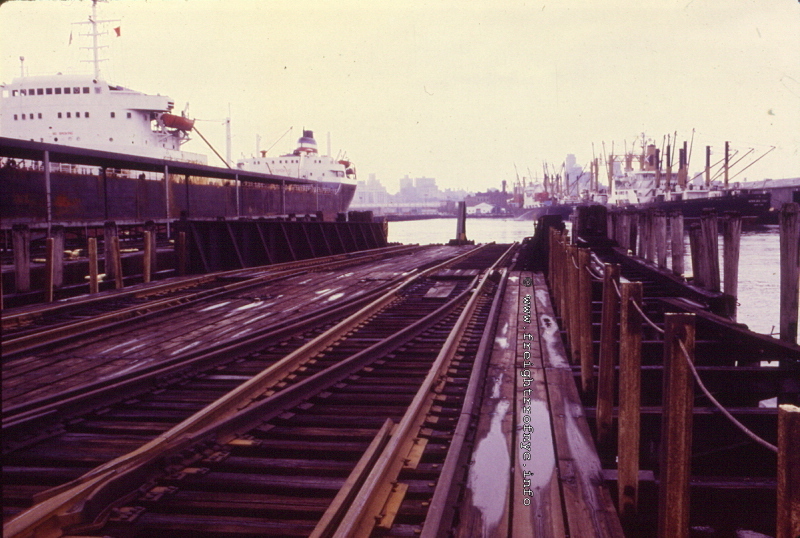 The southern lead track from the float bridges, veered towards the bulkhead into a modest stub ended yard to the southern end of Fulton Terminal. The following images are some of the best overall views of the Fulton Terminal this author has seen to date. 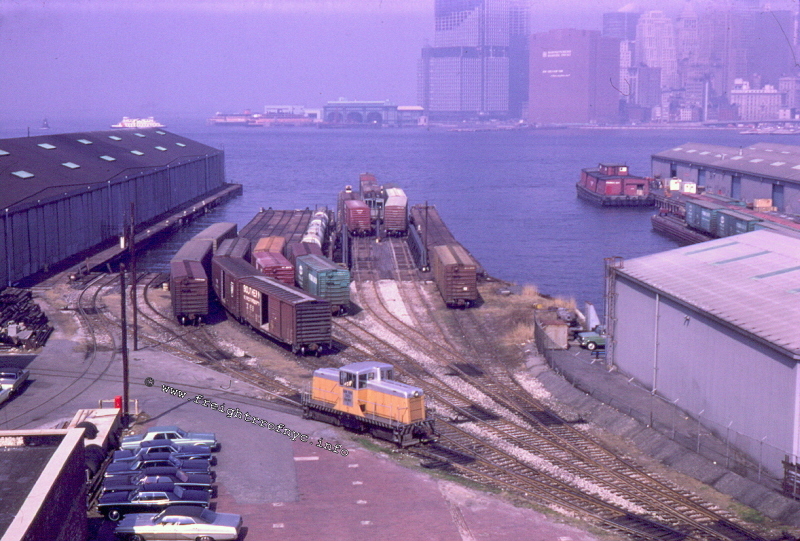 It clearly shows the float bridges, pier yard, finger pier, track arrangement, yard office (square building on left), tugboat and locomotive as they were in October 1966. These photos were taken from the Brooklyn Promenade overlooking the Fulton Terminal. Of especial importance, these photographs, taken on different dates by different photographers illustrate the float bridge replacements at Fulton Terminal over the ensuing years. Note two pony truss float bridges in place. New York Dock "Brooklyn" at southern float bridge. Note southern float bridge has been removed, northern pony truss float bridge remains. Pony plate girder float bridge now installed in southern slip, northern float bridge remains a pony truss. New York Dock "Brooklyn" i/f/o left floatbridge. Note scaffolding around NYD Offices. Looking down upon stub siding along Furman Street. This siding & structure served Watchtower paper unloading. is moored in slip where north float bridge used to be. ex-B&O "Roy B. White" and New York Dock "Brooklyn" (second) on northern side of finger pier. Also take note of the damaged boxcar roof between the string of boxcars and the James H. Clark. ex-B&O "James H. Clark" floating machine shop. "James H Clark" is moored where north float bridge used to be. Also take note of the damaged boxcar roof on left edge of photo. Looking south. Float bridges to right, enginehouse to left. In early 1980, the northern carfloat apron was removed. The Fulton Terminal was the central operating part of New York Dock for almost the entire life of the company, but on February 1, 1982; the entire terminal was shut down for good. The property was used for storage until being completely abandoned. 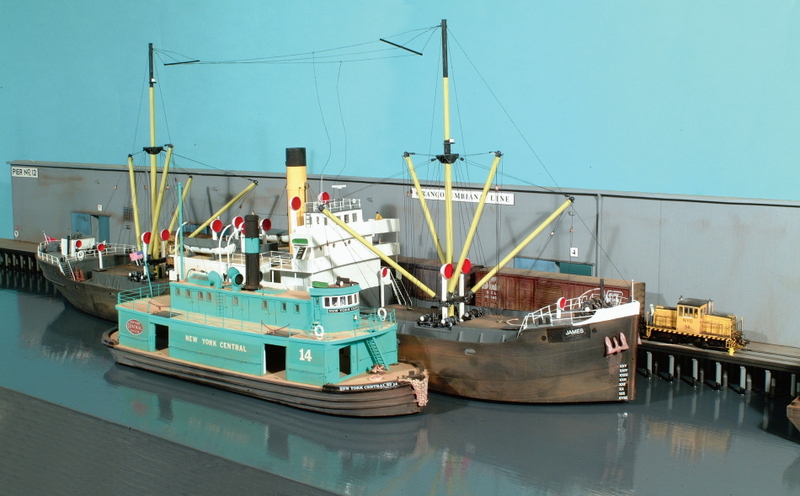 Upon the cessation of joint New York Dock / Brooklyn Eastern District Terminal operations, the unused locomotives would be placed on a carfloat and stored in the Fulton Terminal, in the hopes some would be sold. 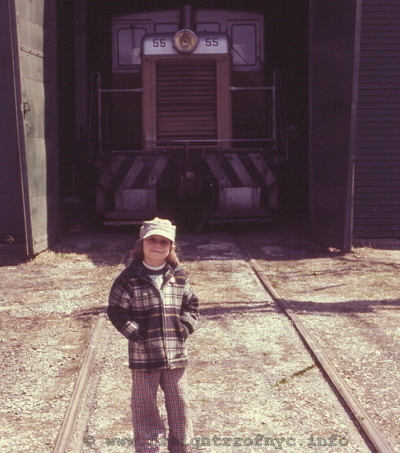 Only one locomotive #55, would be. 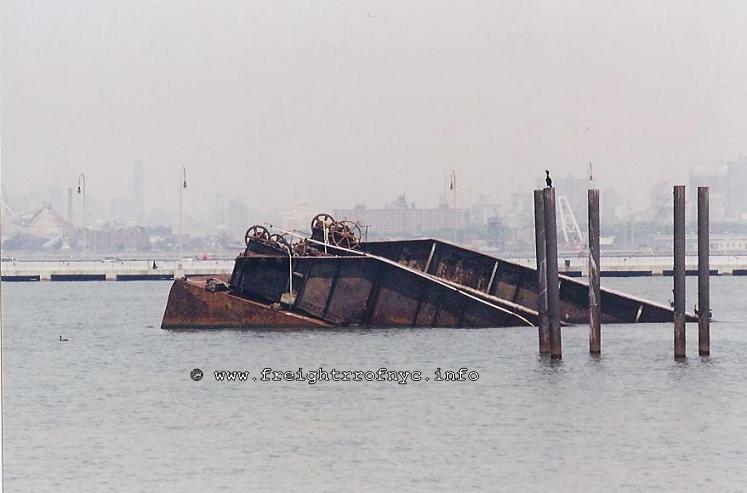 An image seen on eBay dated Winter 1985 shows the float bridge sunk. This is the earliest date thus far ,that we can ascertain the Fulton Terminal float bridge being sunk. Taken from East River on board the ex-Lehigh Valley Tugboat Cornell. This location was inherited in the purchase of the Brooklyn Wharf & Warehouse Company in 1901, which operated this facility prior to this date. The Atlantic Terminal was located at the foot of Ferris and King Streets, in the Atlantic Basin. The Atlantic Basin is off of the Buttermilk Channel, and is a "T" shaped protected harbor with large piers on either side. 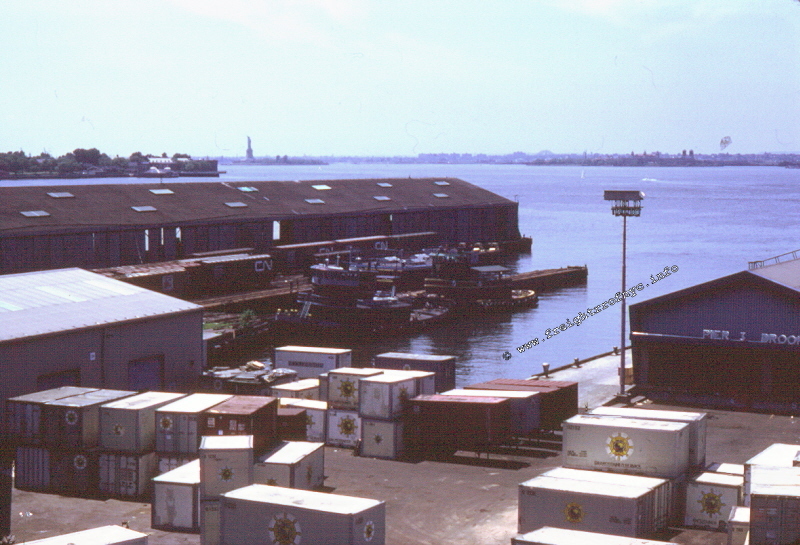 The Atlantic Terminal Yard was located on the south end of this basin and had only a single carfloat apron, with a pontoon style float bridge located at the foot of Ferris Street. The image below is of the pier and track arrangements and is dated 1911. Of particular interest, is the fact that the trackage between Commerce and Bowne Streets is a complete loop. But by the 1929 E. Belcher Hyde property map below, this would only be a semicircular stub yard. Also interesting is the fact that trackage ended at India Wharf & Sum (Summit) Street. By 1929, this trackage extended the western most reaches of India Wharf and into Pier 33. Following its acquisition, New York Dock commenced on a substantial investment in improving the Atlantic Terminal infrastructure, including but not limited to reconstruction of piers, piersheds, bulkhead, and transfer bridge. (currently known as Pioneer Street) and Commerce Street did not show any trackage, so I omitted it to keep image size down. Both maps are proportioned to one another, even though the scales at which the maps were drawn were different. Out of view in the 1924 Fairchild Aerial Photo above but ascertained from the E. Belcher Hyde Map of 1929 seen above, a turnout at Bowne Street led to a 180 degree turn to the east to double back to Commerce Street where it served a small yard and customers (block 507): Ault & Wiberg, American Maize Products J. A. Casey, a copper works and Building Trades Paint & Specialty. As previously seen in the 1911 track map, this yard was originally a full loop yard. Apparently part of the yard would be demolished and structure built to increase tenancy. Continuing along the "main" on Conover Street, and one block north from the turnout at Bowne Street you will veer west onto at India Street at the intersection of India and Summit Streets. Approximately 200 feet west from this turn you will reach the twin trailing point turnouts for Rubel Coal Company (block 515), which had two spurs. 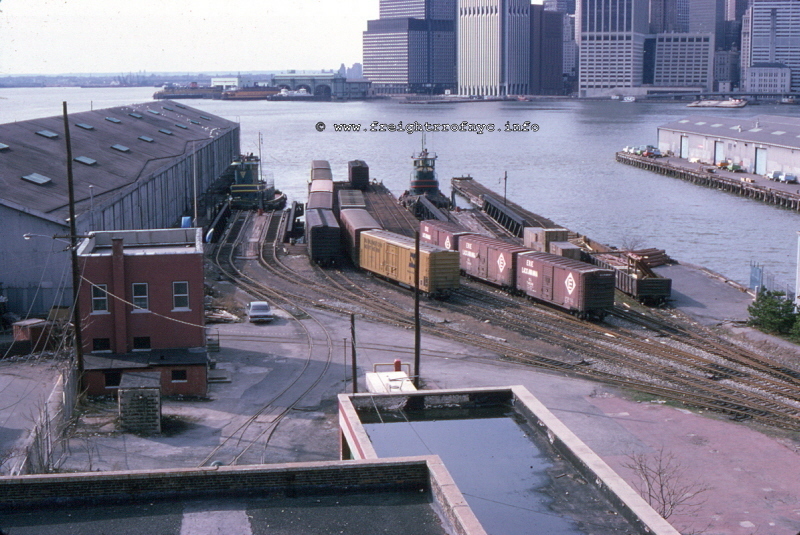 250 feet further west from the Rubel Coal turnouts, the track now curves south (left) into the large piershed to serve: Grace Lines, Panama Mail Steamship and New York Dock Co. 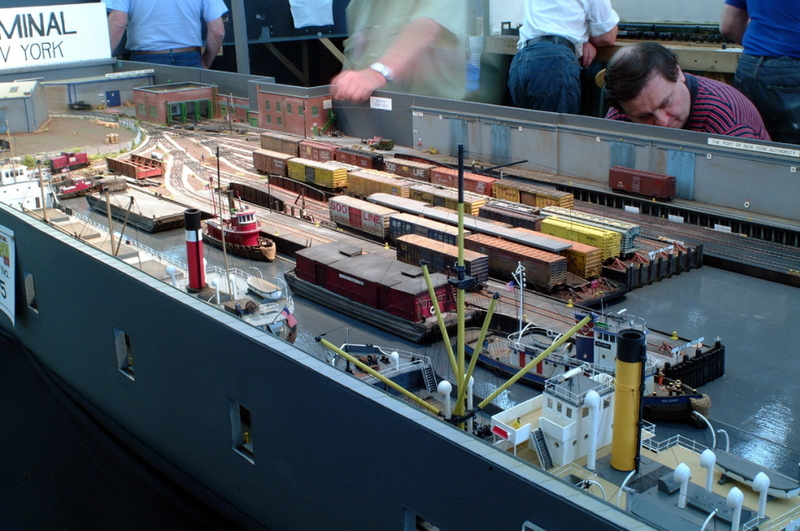 Returning to the float bridge, the west leg of the wye led to the large railyard which was parallel to the main New York Harbor bulkhead, where an overhead gantry can be seen. The wye at the foot of the floatbridge appears to be on pilings just off the south bulkhead. Due to the nature of the photo, it cannot be determined if the usual double crossover on the float bridge approach was used. Judging from the short distance between bulkhead and floatbridge, it does not seem likely. 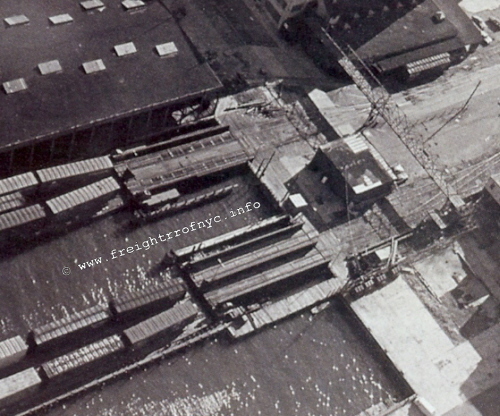 In the early years and prior to the first yard rebuild in May 15, 1963, (as seen in the 1924 and 1951 Fairchild Aerial Survey Photos above), the tracks coming off the floatbridge, was sort of a "wye" with two of the legs leading off the float bridge situated on pilings and the third leg on the bulkhead. A most unusual arrangement! The east leg of the wye led into a double track that ran along the south bulkhead of the basin. While either of these photos are a bit blurry, this track followed the contour around the bulkhead and curved onto the east bulkhead wall and proceeded along Conover Street north to Bowne Street. Unfortunately, the southern portion of the railyard is cut off in the photo, but a coaling tower can be seen at the very bottom edge of photo. We can also see a small tank farm was built after 1924, but prior to 1951 as well as an overhead gantry. The Port Terminal Map as issued by the Army Corp of Engineers is a bit more simplified. The first reconstruction of the Atlantic Terminal took place during 1962 with completeion and a reopening ceremony being held May 15, 1963.
in coordination with Waterfront Redevelopment Program of the Marine Terminal Department of Port New York Authority. Almost every type of general construction work was involved. Tracks were designed and installed to meet AREA standards. One-hundred-pound rail, fabricated in the Steelton Plant of Bethlehem Steel Co.
on the inside. Switch points are guarded wherever possible. Stone-ballasted tracks have heat-treated switch points and solid manganese frogs. Furnished by Coppers Co. are treated with creosote. Team track driveways, 50 feet in width, were paved with asphalt by the Sicilian Asphalts Paving Co.
are built of creosoted piles and timber. George W. Rogers Construction Corp. was the contractor for the bulkhead and trestle work. The all-steel float bridge was relocated by Merritt-Chapman & Scott Corp.
One-story T-shaped 1600 square feet, concrete floor and foundations resting on creosoted piles, concrete block walls and insulated steel roof. Zerbo Construction Co. general contractor. Capital electrical work by Reynolds Electric Co.
more than half a century. Its officers and supervisory personnel are exceptionally well qualified to offer the best in services through their long experience with the Railway. Reuben W. Askanase - chairman, Dunhill International Inc.
John. B. Barrett - treasurer, Dunhill International Inc.
Aaron J. Farfel - vice president, Dunhill International Inc.
Cyril R. Porthouse - president, Dunhill International Inc.
Strangely, the yard capacity is not listed. 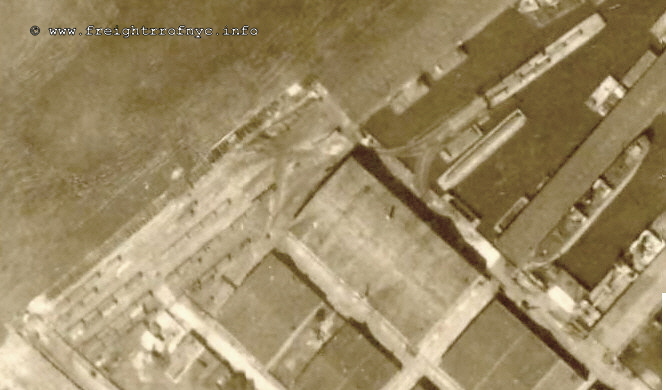 But we do know it had been expanded when the cluster of fuel tanks and the old brick east / west warehouses seen in the 1951 Fairchild Aerial were torn down. Also, yard track orientation was changed. Instead of north - south yard stubs, the yard lead off the float bridge would run southwest / northeast with yard spurs heading east. This expansion and reorientation is reflected in the US ACoE Port Terminal Map seen above. 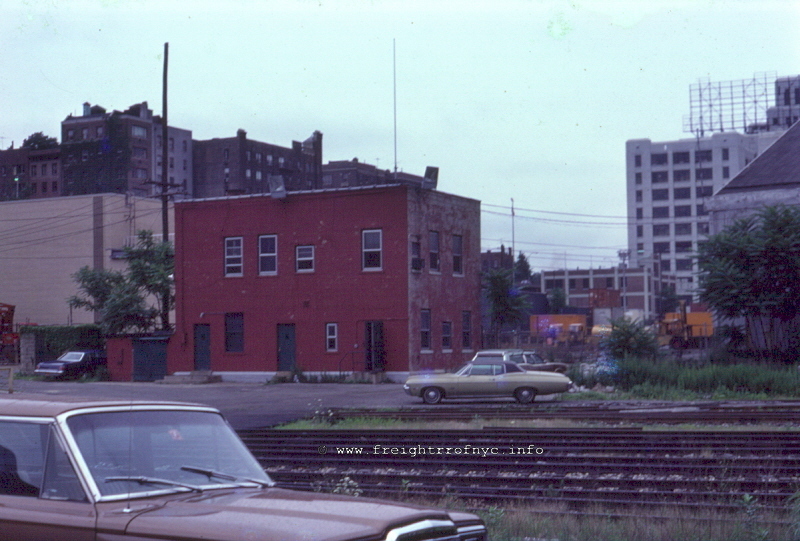 The following photo was taken in the new yard looking west from Ferris Street between Sullivan & King Streets. The tracks on the right side of the photo are for assembling and readying strings of cars for the car float. The float bridge is behind and to the right of the photo. It appears that the eastern portion of the basin was filled in to the western piershed (not the main American Stevedore piershed on the Buttermilk Channel bulkhead). The two small narrow piersheds jutting out into the basin were demolished, and a new larger warehouse (#11 in the Port map above) was constructed for Maersk Lines on the new east bulkhead. Returning to the float bridge apron, the wye was removed, but the float bridge lead still extended from the bulkhead to the float bridge. Here is a photo of the float bridge lead and float bridge located at the Atlantic Terminal. A small railyard stood on a portion where the old brick warehouses were located. 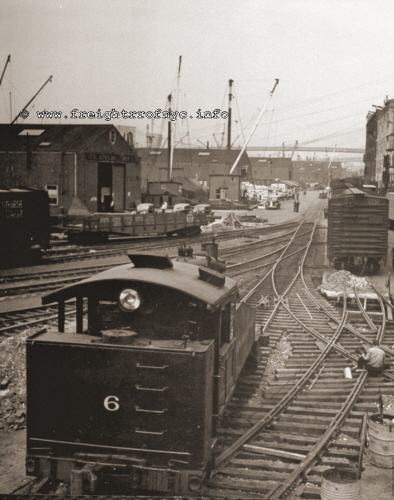 This trackage of this new yard connected at the east end to the track and ran down Conover Street (which appears to have been extended as a result of the filling in of the basin). 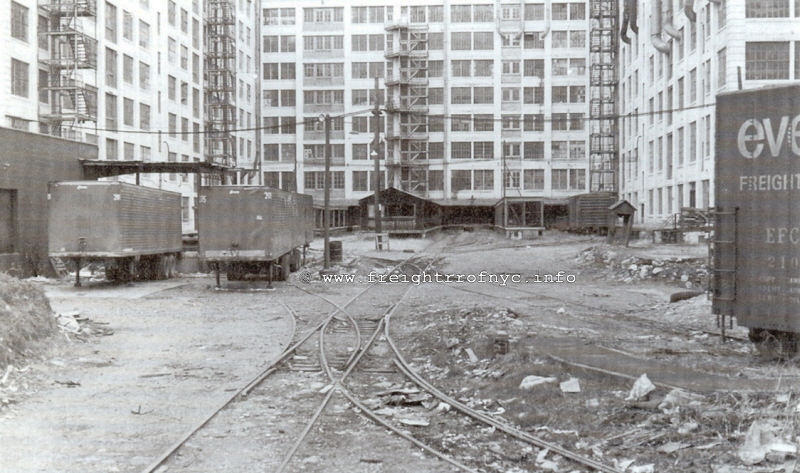 As a result of the new construction, Atlantic Terminal trackage that led to Bowne Street now comprised of street trackage on Conover Street between the old warehouses on the east side of the street and the new Maersk warehouse on the west side. Proceeding north on Conover Street, a spur at Verona Street led to a small three track yard was built between Conover, Imlay, Verona and Bowne Streets. The main track (street trackage) continued to proceed north on Conover Street to Bowne Street where in made that 180 degree turn to double back to Commerce Street as originally designed and discussed in the chapter above. However, the segment that proceeded to India Street and west appears to have be removed from service, as it no longer appears on the map. 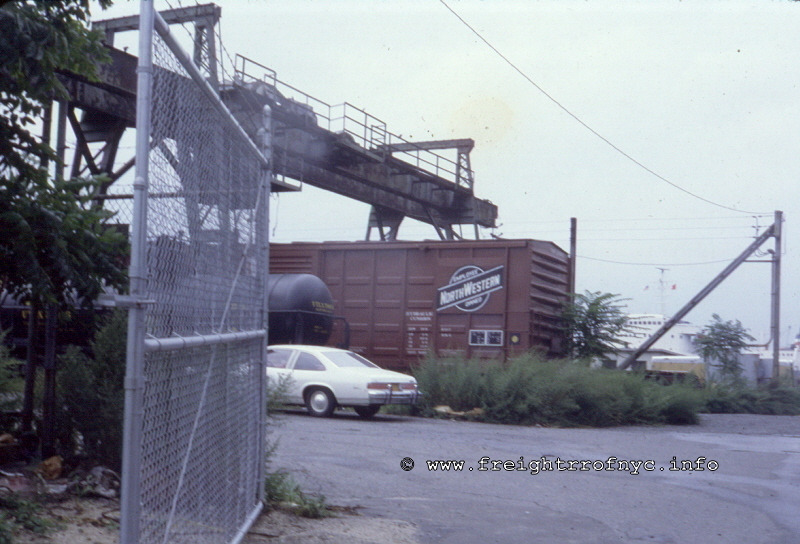 In the Atlantic Terminal yard was a gantry crane. It does not appear tall enough to load containers but does appear to load standard bulk freight. Looking east at Silver Flour warehouse and overhead gantry crane. "My family's business was Silver Flour Warehouse and Trucking Corp. We leased warehouse space at the 149th Street Yard starting in 1932 and ended in April of 1968. 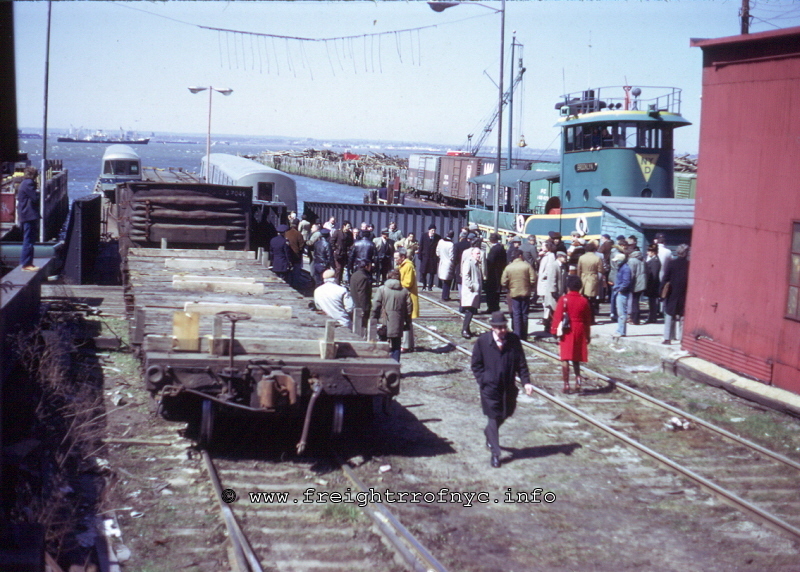 From there we moved to the New York Dock Railroad, Atlantic Terminal." 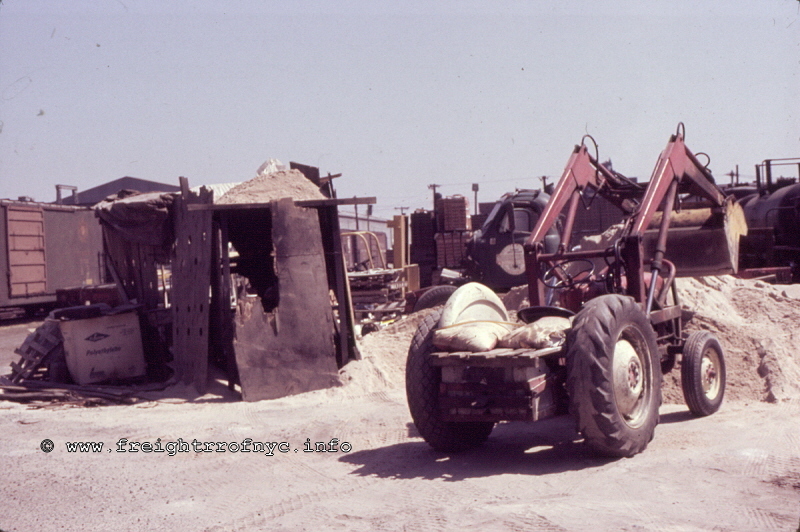 The retailer would load the sand into a small silo with a bagging chute on the bottom. A kerosene heater under the silo, dried the sand to allow it to flow freely. Once bagged and sealed with a wire twist tie, the sand bags would be stacked on pallets. According to Brad Sobel this sand retailer was Paul Marckesano and Sons. Looking North. Entrance to yard at King & Ferris Streets. Silver Flour warehouse on right. 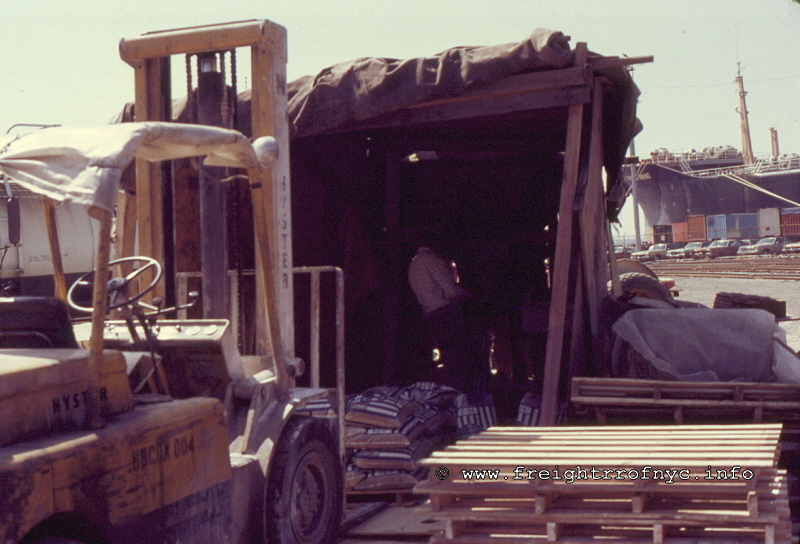 Note the top most portion of the cab of a 44 Tonner just above the horizontal brace of the left chain link gate! Looking east. 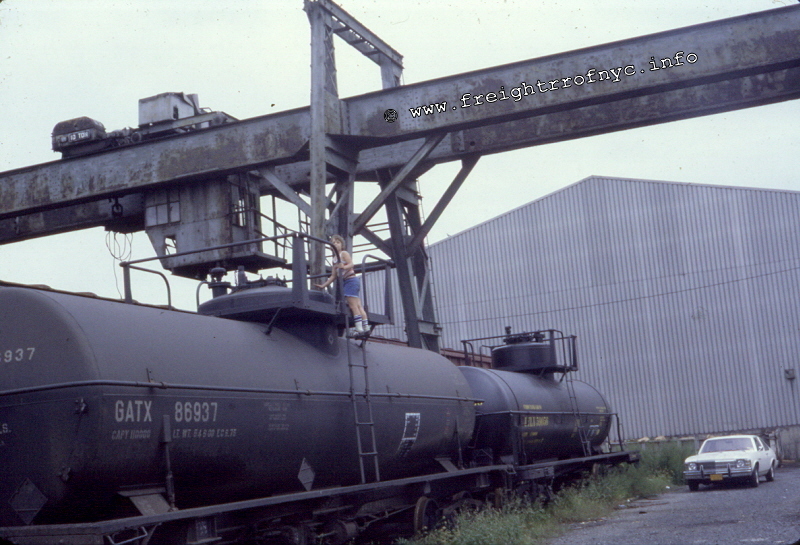 Some little brat climbing on the tankcars (but that's not our car). The second of the Atlantic Terminal rebuilds took place in 1982, and this would be the final arrangement. I am currently seeking a track plan from this era. 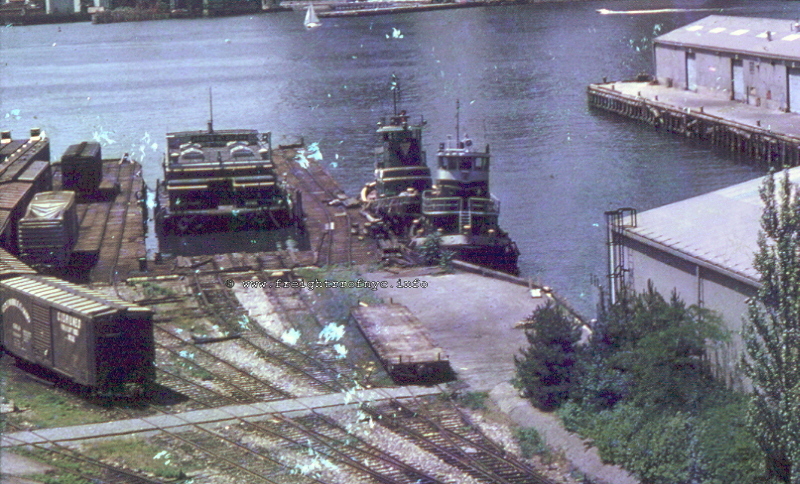 This yard arrangement ended up surviving the transition into New York Cross Harbor ownership and was used until 1992 with service to American Stevedoring until that date. 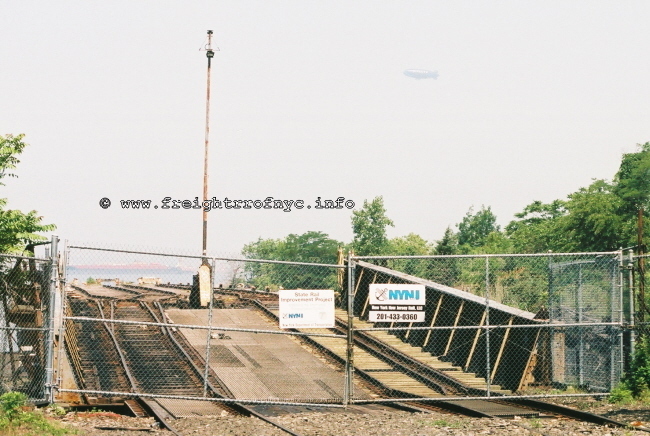 While freight service ended in 1992, the yard trackage was not torn up until 1996 (by the City of New York), and in 2006 the float bridge was removed to make way for a new passenger cruise ship terminal. Fortunately, the two original New York Dock multi-story concrete construction warehouses have been preserved, if not for being converted into condos and storage. The following image was taken from the water onboard the Lehigh Valley tugboat "Cornell" on a rail marine tour of New York Harbor. The Baltic Terminal was the last of the New York Dock owned terminals to be built and the first to be demolished. Baltic Terminal was located between the Atlantic and Fulton Terminals along the bulkhead of the East River at the foot of (what else?) Baltic Street. The Baltic Terminal was the smallest of the New York Dock terminals, and employed the use of a single float bridge and consisted of two yards oriented east / west. One yard was located between Harrison and Baltic Streets (southern yard), and another between Baltic and Warren Streets (northern yard). Paul Strubeck located the following newspaper article in the 1915 Brooklyn Daily Eagle Almanac. It announced (interestingly enough) the proposal to acquire the New York Dock Company's "Baltic Yard" for the purpose of the "South Brooklyn Terminal / Brooklyn Marginal Railroad", which is discussed at length on another page of this website. This proposed "South Brooklyn Terminal / Brooklyn Marginal Railroad" would not see creation, and the Baltic Terminal would remain a New York Dock property. 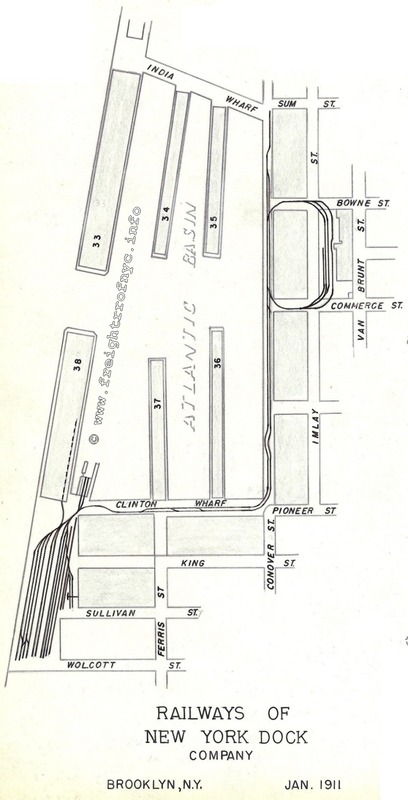 An E. Belcher Hyde property map from 1929 gives an approximation of the trackwork at the Baltic Terminal along with the significant commercial occupants in the area. 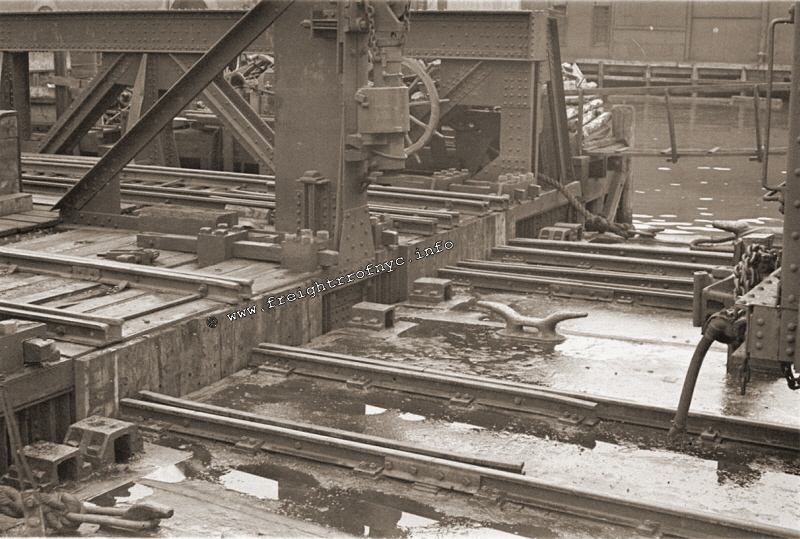 A small leg off the float bridge would eventually be extended from the original trackage in the 1911 map above and run north for three blocks to the foot of Amity Street where the New York Dock Company would come to have a warehouse. On 24 June 2010, Joe DeMay forwarded the following image to me for location identification. 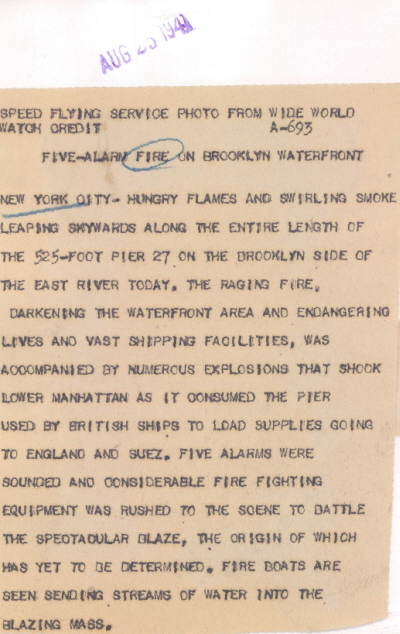 The description on the back of the image simply stated Pier 27 in Brooklyn. But I quickly took note of the carfloat and float bridge on the right edge. Clearly this was not the Brooklyn Eastern District Terminal or Fulton, Atlantic or Bush Terminals. I referenced my 1940 New York Freight Terminals map from the New York Central. As it turns out, Pier 27 was Baltic Terminal. 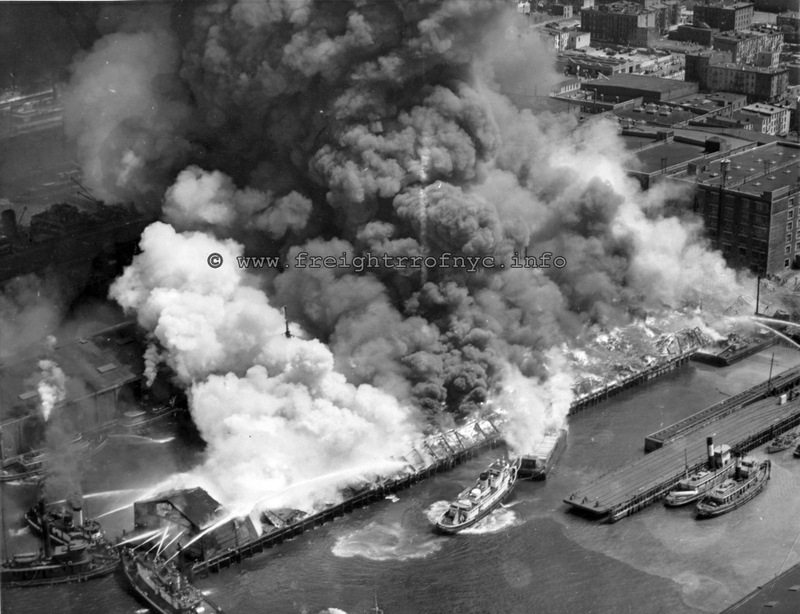 So, with that, we now know that the Baltic Terminal suffered a large pier fire in 1941. 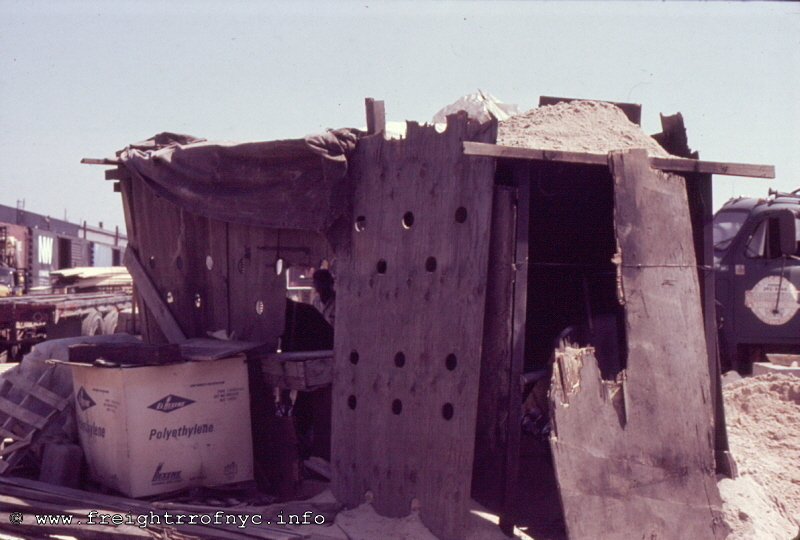 In January 2011, I acquired several 35mm negatives dated 1951 and attributed to Branford Stiles as photographer. Upon receiving and scanning them, Joe Roborecky and I began to look them over. Lo and behold, we realized that the following were taking at Baltic Terminal of the float bridge! With Governors Island in the background. The Baltic Terminal still appears on the 1956 edition of the Harbor Terminals Map and other than Baltic Terminal being sold in 1962 and razed to make way for a new container terminal, further information and photographs are lacking and desperately needed. 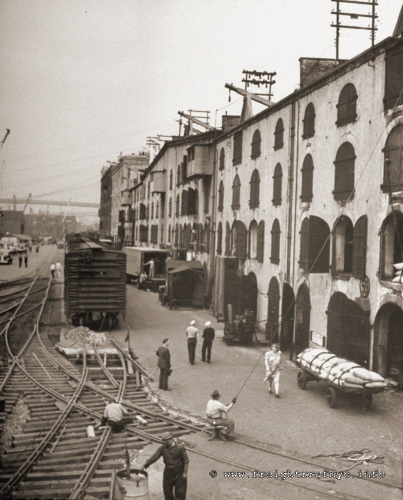 The New York Dock Company also maintained several piers and warehouses in the Red Hook section of Brooklyn, south of the Atlantic Terminal. These warehouses did not have railroad service, and further information of these properties is lacking. Piers 39 juts west from the tip of Brooklyn at the foot of Coffey Street and the southern entrance of Buttermilk Channel, with piers 40 through 45 following the contour of Red Hook peninsula with Pier 46 ending at the foot of Van Brunt Street. 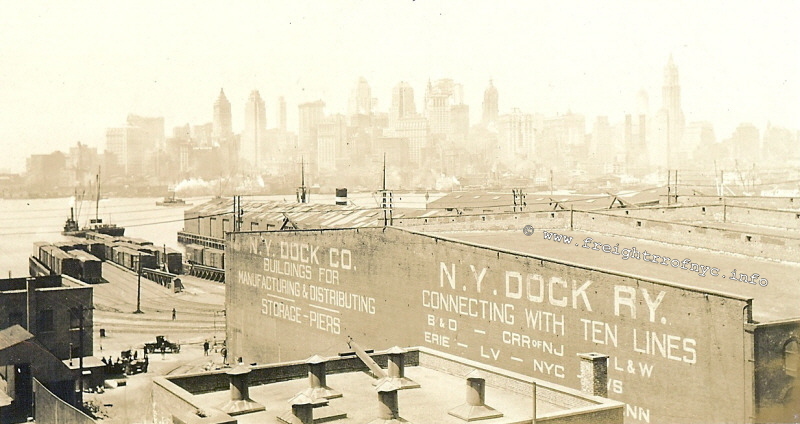 The largest property that New York Dock would come to operate, would be Bush Terminal, but in actuality; New York dock would not own the property. In 1971, Bush Terminal went bankrupt and the City of New York City purchased the underlying land and property. It would lease the railyard and railroad operation to New York Dock and on March 11, 1972 rail operations commenced and would continue to serve those Bush Terminal customers as before, but it has been understood that a surcharge was now charged to those customers desiring rail service to help offset the increasing costs of that service. 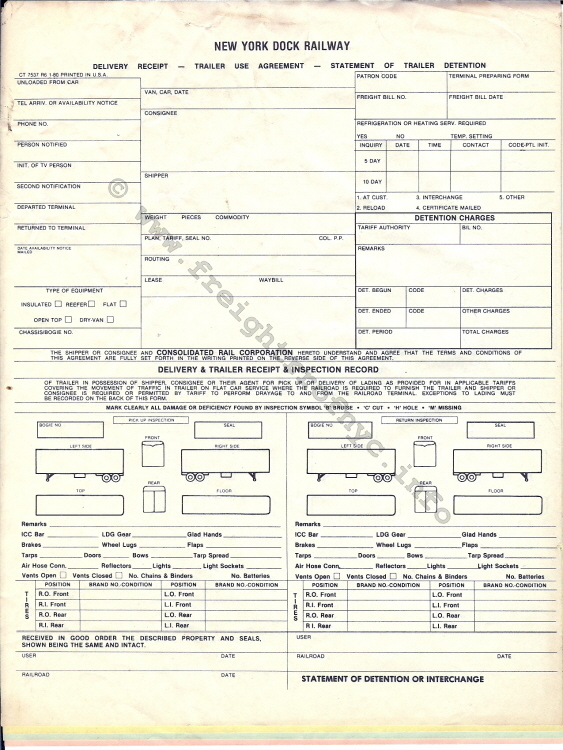 Please refer to the Bush Terminal page on this website for in-depth property and facility information prior to this 1972 date, as well as track maps. 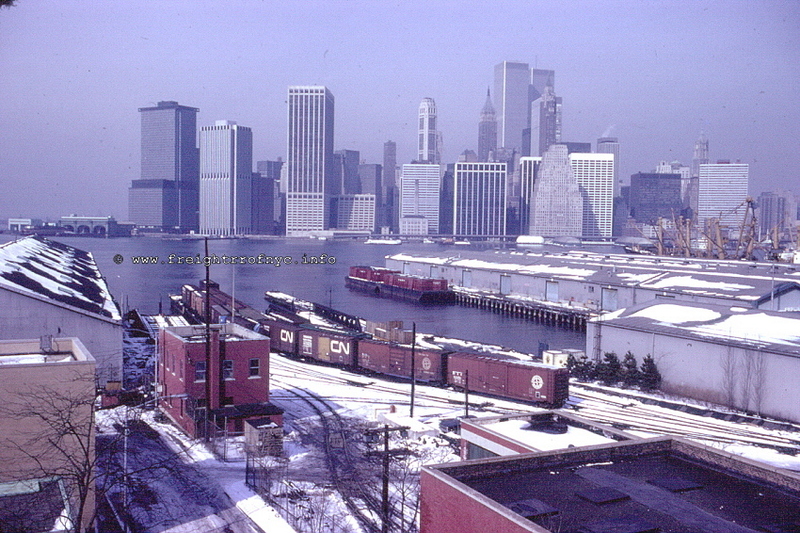 The following image, taken by Tom Flagg in January 1975, shows the rail service that the Bush Terminal loft buildings could take advantage of. If not for the date, semi-trailers, the Evergreen boxcar and the litter, this photo could very well have been taken any time between 1920 through 1950's. Looking east at Loft Building 19 & 20 rail service alley. 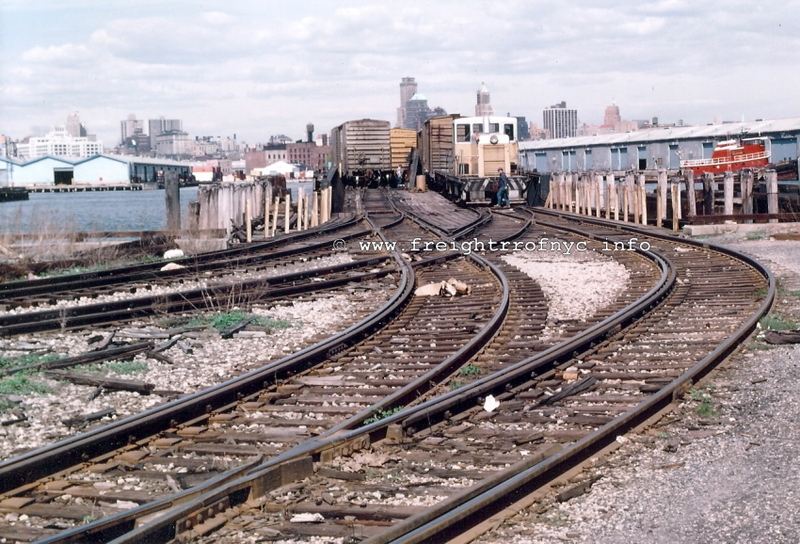 As with Bush Terminal operations before it, New York Dock would also enjoy the advantage of interchange with Penn Central and later Conrail at the 65th Street Yard. 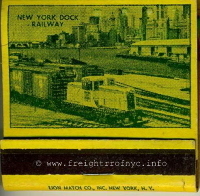 New York Dock would also interchange with the New York City Transit Authority by way of the South Brooklyn Railway at the 39th Street and Second Avenue interchange. 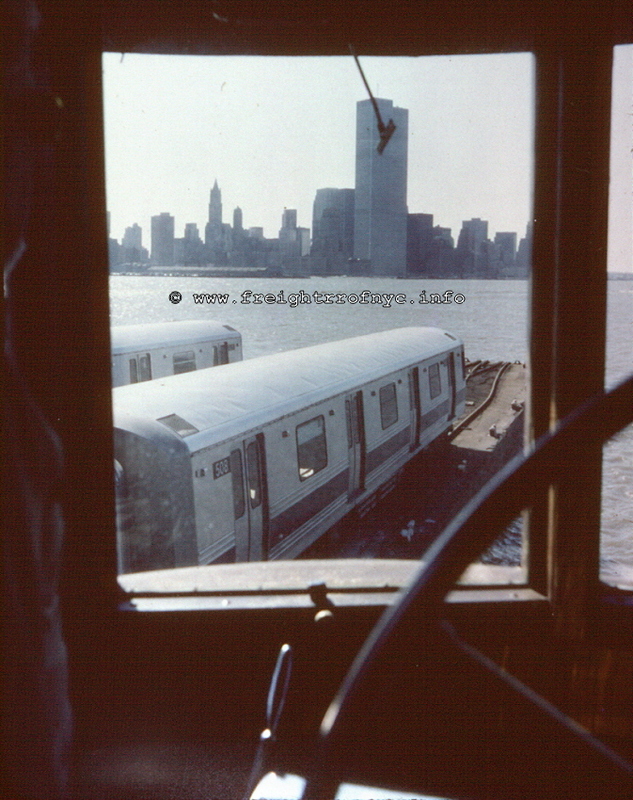 Throughout the 1970's and early 1980's, New York Dock would carfloat into Brooklyn and deliver to the South Brooklyn Railway many new subway cars, as well as ship out subway cars to either be rebuilt or scrapped. 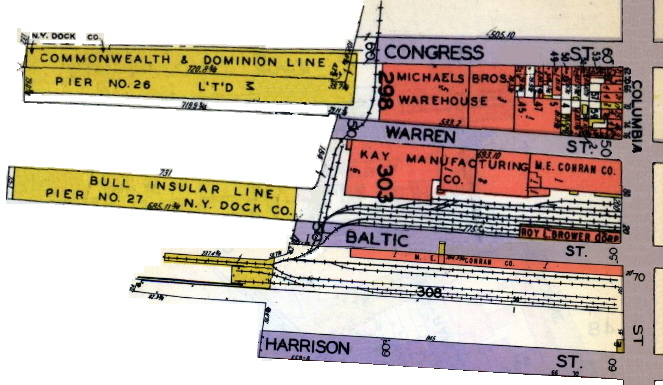 For the most part, the trackage layout of Bush Terminal would remain unchanged during New York Dock's operation of this facility. 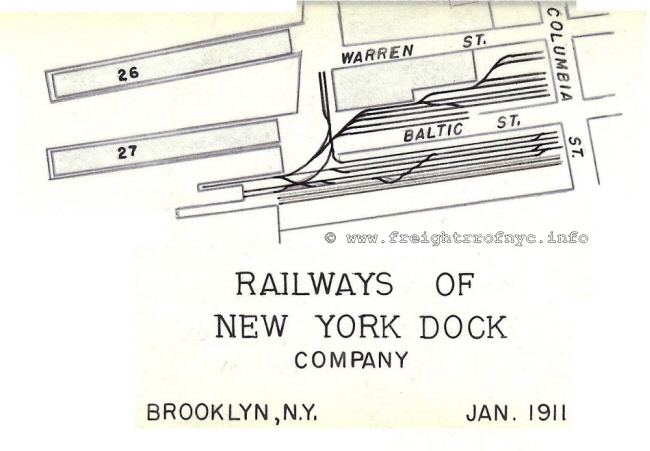 Paul Strubeck acquired the New York Dock - Brooklyn Waterfront Rail Rahabilitation Project Conceptual Track Alignment Maps and dated for 1978. Keep in mind, these maps reflect proposed alignment, but they are highly accurate to those tracks that were installed following the reconstruction. 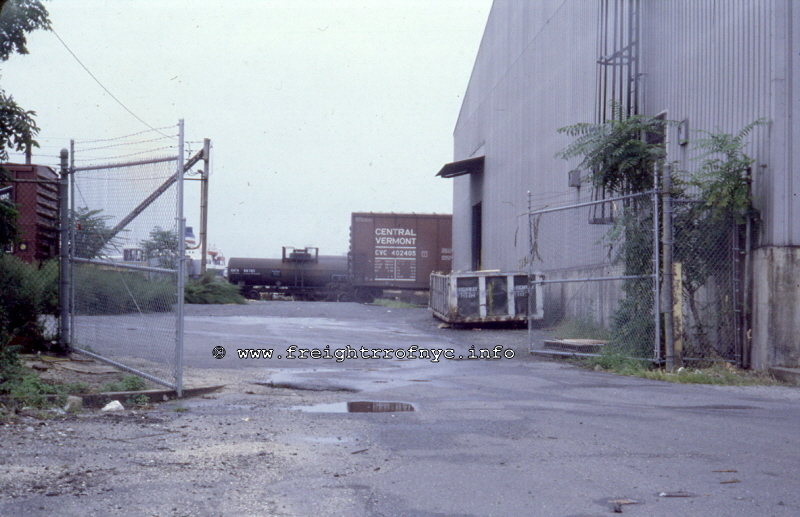 However, rail service to several of the "alley" sidings located along the avenues serving former industries would be discontinue, with the core of railroad operations focused on what would be either Bush Terminal Yards or the street trackage leading to South Brooklyn Railway interchange. The maps were printed in two sections: "Drawing 3" (North) & "Drawing 2" (South). Clicking on the images will open a larger version of the map for better legibilty. 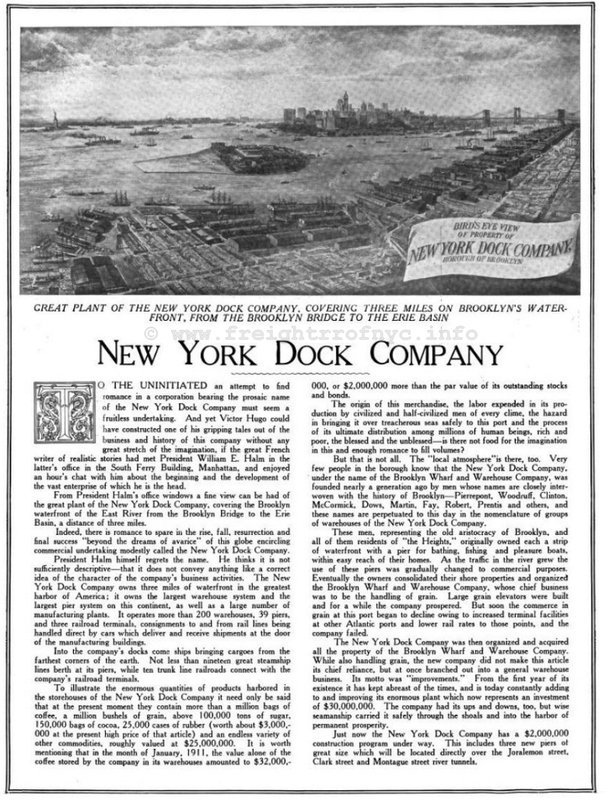 New York Dock would inherit the use of the two pony plate girder float bridges, located at the foot of 50th Street. These float bridges were known as "Bush 1" (southern or left, when facing west / New Jersey) and "Bush 2" (northern or right when facing west / New Jersey). 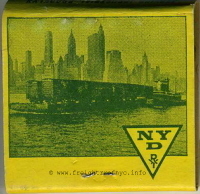 Sometime after 1975, New York Dock would undertake a float bridge rehabilitation program. Bush 1, as we can see in the images following, was originally a three girder design while it's neighbor was of two girder design. This float bridge was slightly different from its northern neighbor. Bush 1 had three girders: one girder on each outer edge, and one up the center; while Bush 2 would only have 2 outer girders. 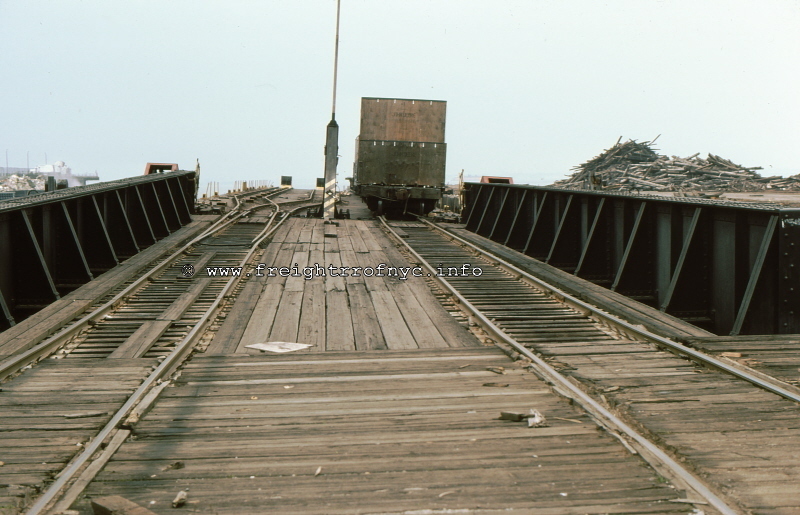 This three girder float bridge (see Bush Terminal page for images) would remain in service until June 1978 at which time the float bridge needed to be replaced (the reason for this is currently undetermined). 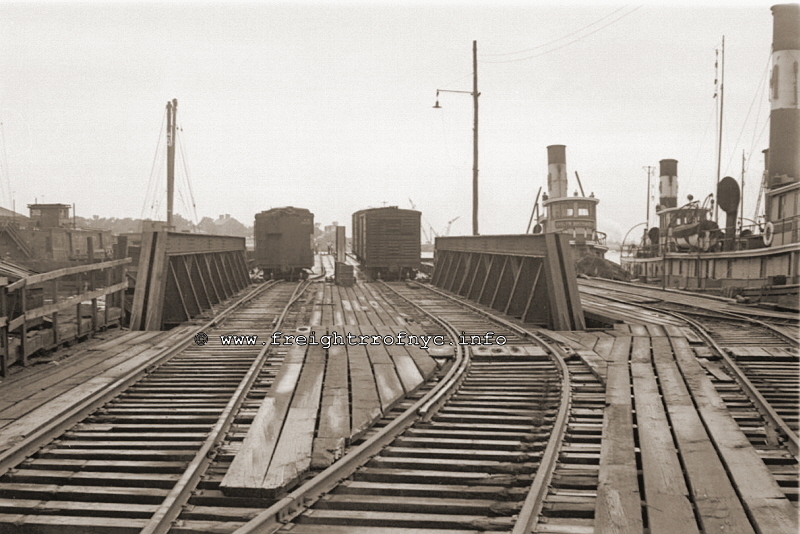 The "Bush 1" replacement float bridge was "recycled" from the Delaware, Lackawanna & Western Railroads' Hoboken facility and was a two girder design (believed to be from slip #1). 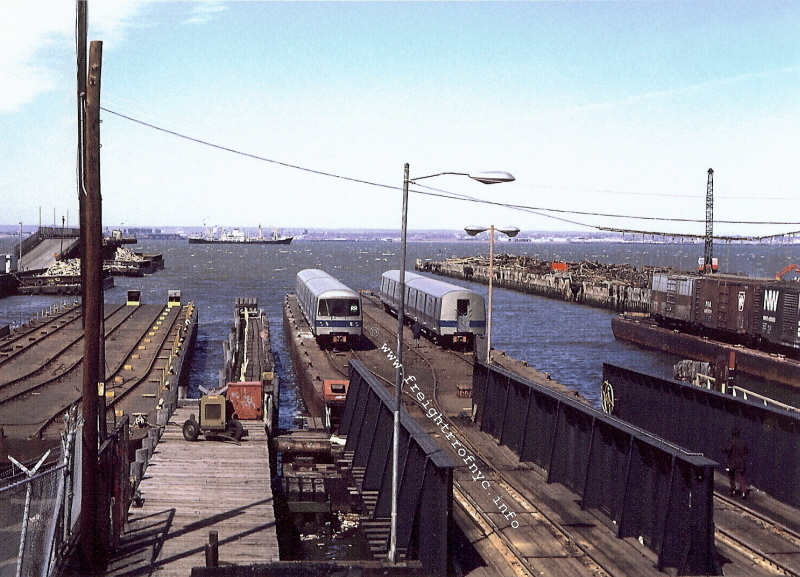 Ben Schaefer was fortunate to capture the float bridge "exchange" on film, and these images can be found in Tom Flagg's book "New York Harbor Railroads in color", Volume 2, pages 17-19. This "newer" float bridge is similar in appearance to Bush 2, as it has only two girders. 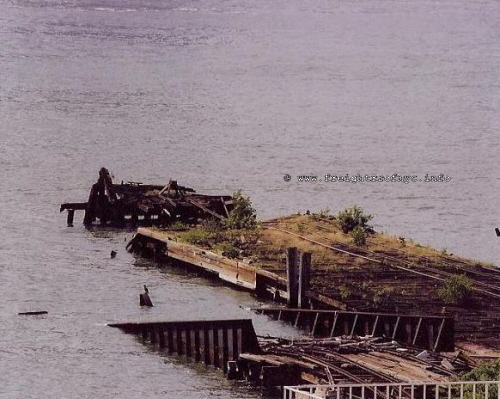 Also of importance, is the fact that the steel float bridge gallows from Hoboken (for raising / lowering the bridge to match carfloat heights), was also brought here (with the DL&W float bridge in June 1975) and installed over the Bush 1 float bridge slip. Ben Schaeffer's anecdotal information reflects that this gallows remained here until struck by a trailer on flat car, and was knocked askew circa 1982, and subsequently removed altogether. This float bridge would remain in service until the pontoon developed a leak (unknown year), and the float bridge sunk. It remains in this state. (see image below). As stated above, this float bridge differs from the original (pre-1978) southern neighbor as it has only two girders. This float bridge deck is believed to have been rehabilitated by Bush Terminal prior to 1970, but this is unconfirmed. In a March 1972 aerial taken by Tom Flagg (seen above) this bridge is shown in service, yet in a November 11, 1975 aerial also taken by Tom (and also seen above), this float bridge has sunk! This sinking must have only been a dilemma of short duration as this float bridge has been in regular service almost continuously. The image below, taken by Jay Held, shows Bush 2 in service in June 1975. Both Bush Terminal float bridges remain in place as of 2008, however: the wood deck of Bush 1 was removed and is in a sunken state due to a leaky pontoon and as such, it is not in service. Bush 2 on the other hand, received a new pontoon and wood deck in 2007 by the current operator; New York New Jersey Rail. 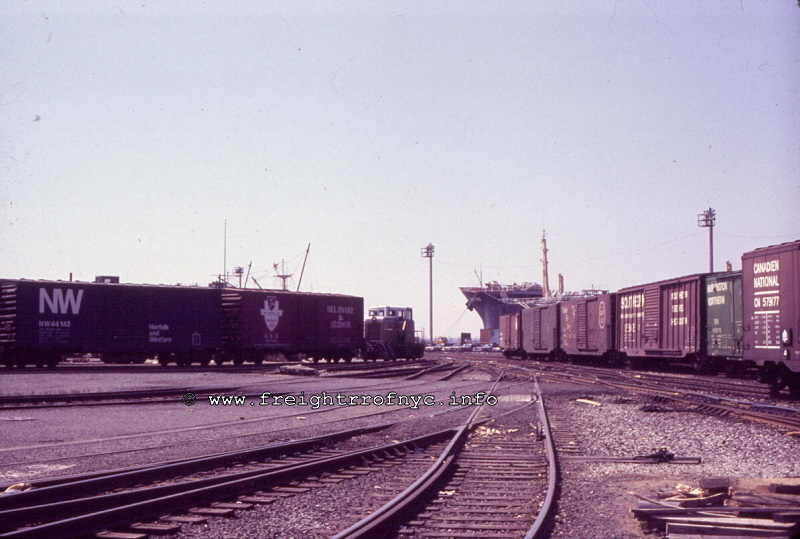 It is understood, that the radius of the float bridge lead trackage for Bush 2 precludes the use of several extremely long freight cars such as 89' foot TOFC carriers and spine cars coupled together (due to coupler draft gear), but these may be unloaded on car at a time from the carfloat. 75 foot subway cars for the New York City Transit Authority however do not have this issue as they were specifically designed for tight radius turns as normally encountered in the subway system. There is rumor that Bush 1 float bridge may be rehabilitated by the current operator; New York New Jersey Rail, but this seems unlikely in consideration of plans currently under development for track realignment to Bush 2 float bridge allowing freight cars of longer length to be received. In service with carfloat attached. Note the blimp! This floatbridge was formerly located at the Erie Railroad's West 28th Street Terminal in Manhattan. 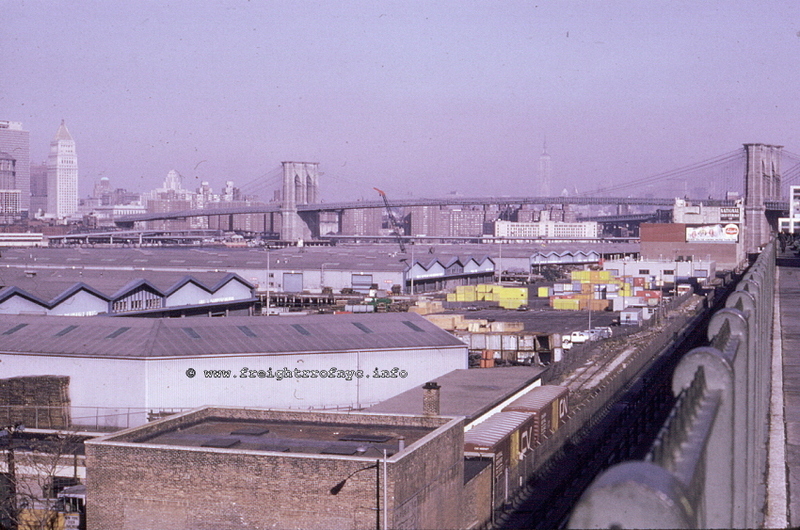 This new (for NYD) floatbridge location was designated as the "Army Terminal Bridge" by New York Dock, but did not see much use by the New York Dock, as New York Dock ceased operations in 1983. 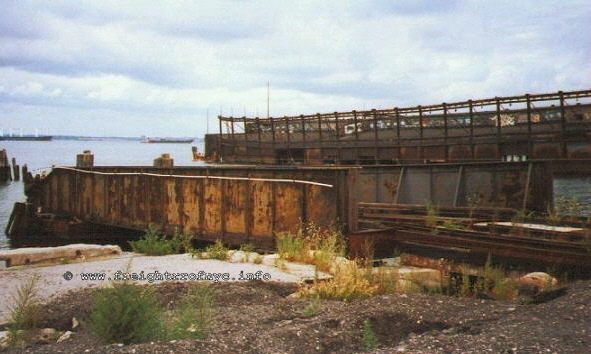 It had been stated that this float bridge was relocated to the Brooklyn Army Terminal adjoining the north edge to the LIRR Bay Ridge Yard) by New York Dock Railway in 1981. 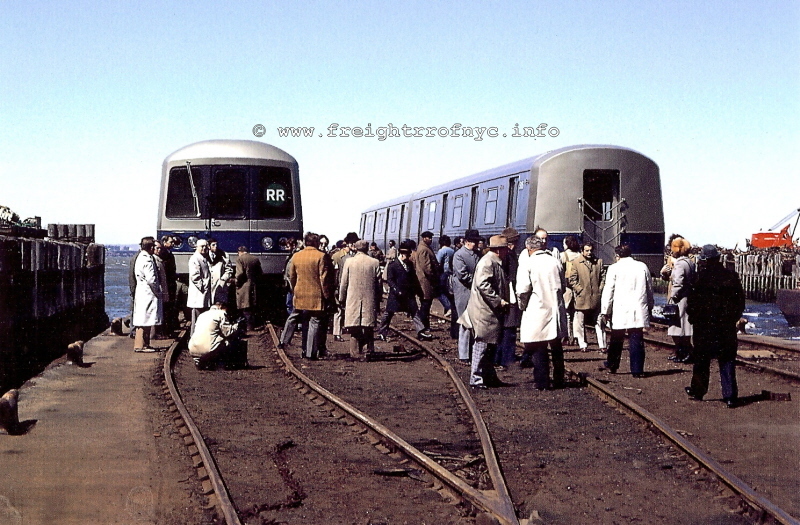 The intended relocation was to ease congestion of Bush Terminal, and to avoid the sharp curves approaching the Bush Terminal float bridges and be be able to the handle railcars of longer length which were gaining use by the Class 1 railroads. This information appears to be incorrect, as new information states that this float bridge was installed to allow New York Dock to continue carfloat service while the New York City Department of Transportation (NYCDOT) reconstructed First Avenue between 58th and 39th Streets. This better explains why the bridge was not in service long (once First Avenue reconstruction was completed it was no longer needed) and why it is not used to this day (as NYNJ apparently receives modern sized freight cars without difficulty at "Bush 2" bridge). 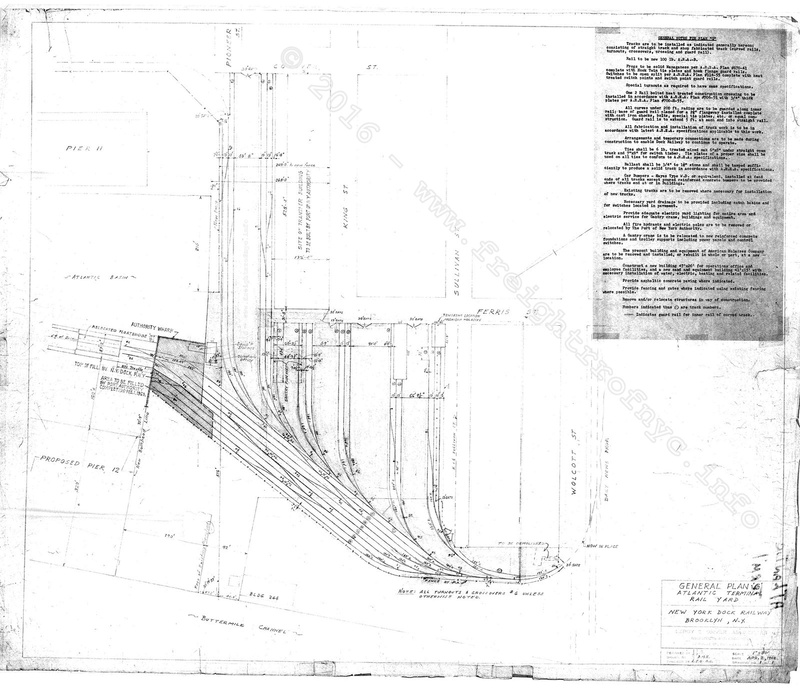 Tom Flagg courteously furnished a copy of the New York City Department of Transportation blueprint pertaining to this temporary transfer bridge installation, of which I reproduced the pertinent details of the image here. I omitted general notes to contractor, drainage piping, spiking arrangements, and cross sections to save on image size. Click on the image below to see a large scale hi resolution image. Use the back arrow on your browser to bring you back here. 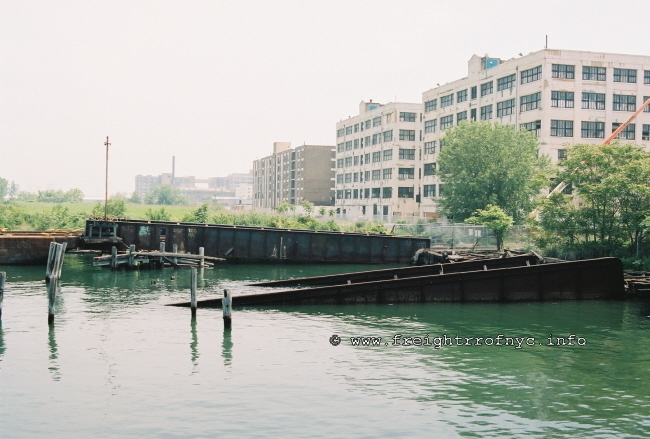 "Reconstruction of First Avenue from 58th Street to 39th Street - Borough of Brooklyn"
"Temporary Transfer Bridge & Connection at Brooklyn Army Terminal"
It has pulled away from its bulkhead moorings. The inner end (land side) is underwater which does not float as the outer end does. As the pontoon is still watertight, that end still floats. Usually, it is the pontoon that usually leaks from age, and the outer end sinks. 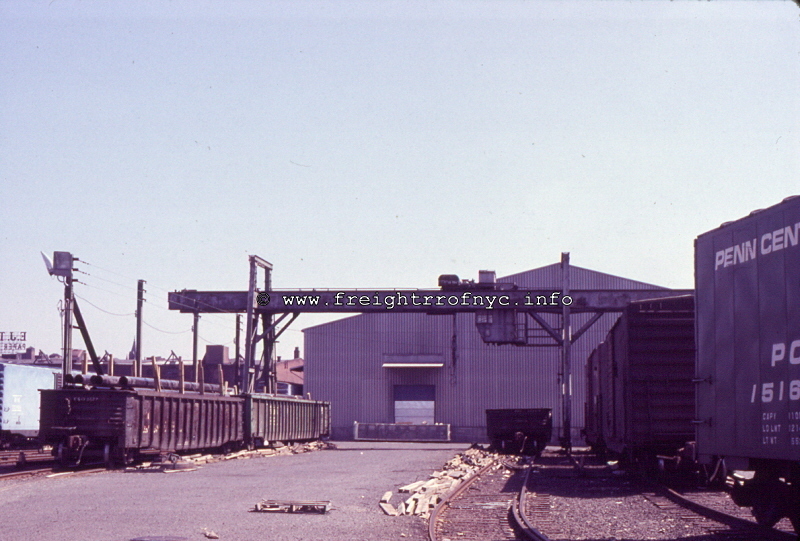 Upon the purchase of, and merger with the Brooklyn Eastern District Terminal in 1979; New York Dock assumed the lease to and the operations of the Greenville Yard and facilities. Greenville when constructed, featured six electrically operated float bridges, numbered 9� through 14. 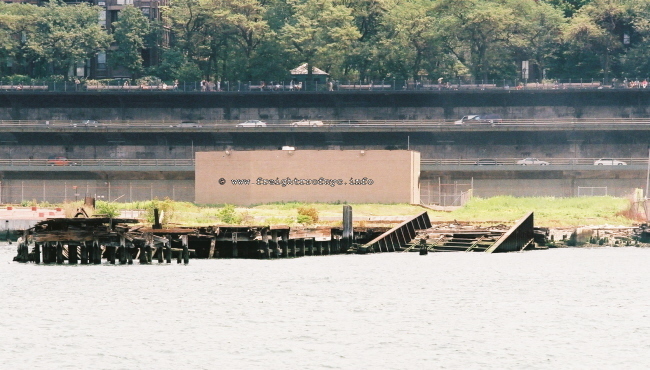 During the time span that New York Dock operated at this location, only bridges 11 and 12 were in service. 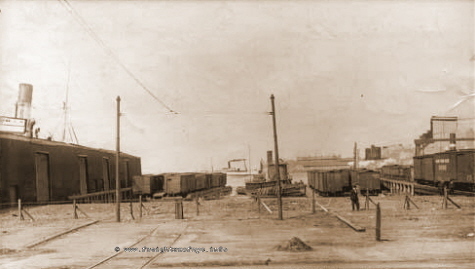 Greenville Yard as constructed, exceeded 27 acres and even had a "hump" yard, but the yard had already been downsized by the time New York Dock operated at this location. 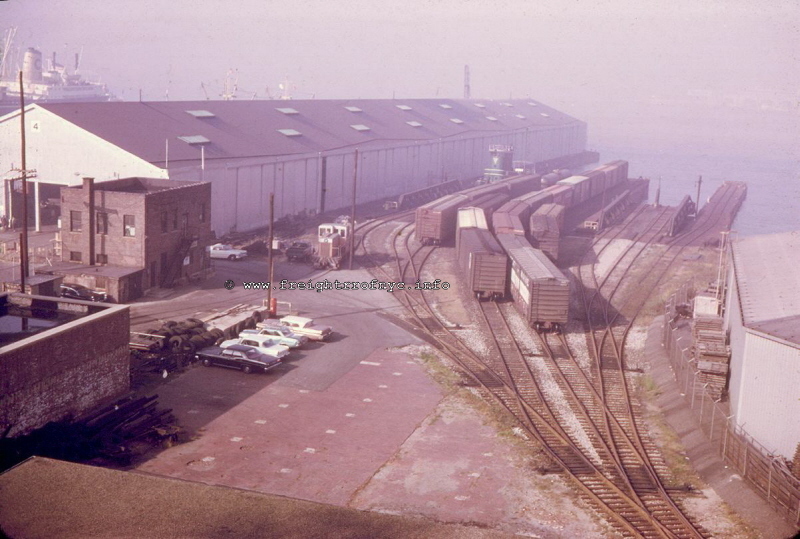 New York Dock was also contracted to perform the carfloating operations for the Baltimore & Ohio Railroads' operations in St. George, Staten Island; as well as the Baltimore & Ohio Railroads' West 26th Street Terminal on the west side of Manhattan. 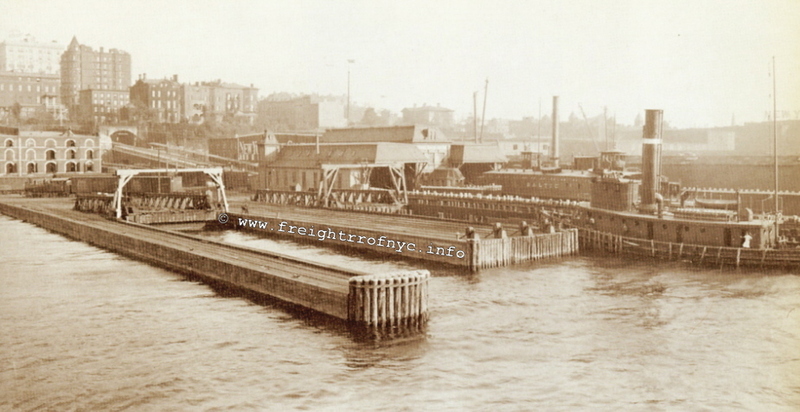 New York Dock carfloat operations consisted of carfloats being transported to and from St. George and Greenville, NJ; as well as between St. George and West 26th Street. 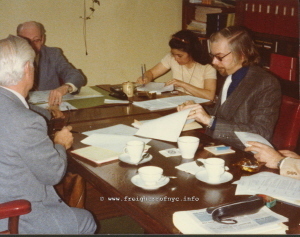 Dates of this operation vary, depending on the resource: P. Strubeck related the dates 1976 through 1979, while the Jersey Central chapter of the NRHS states from September 1979 to 1980. The yard in St. George featured a wood Howe Truss floatbridge, the same kind that is located at the 26th Street Terminal, as well as some piers. As a side note of historical importance, the B&O wood Howe Truss float bridge at West 26th Street in Manhattan still remains and has even been restored. It is now used as a public kayak launching station and is open to the public. have been moved to their own page to facilitate faster loading of this main page. The following images are from Andrew Browne's efforts using the Fulton Terminal. Mr. Browne submitted these images to me on 07 August 2010, and I have to say, I am very impressed with the efforts! It should be noted that Mr. Browne is a resident of the United Kingdom.